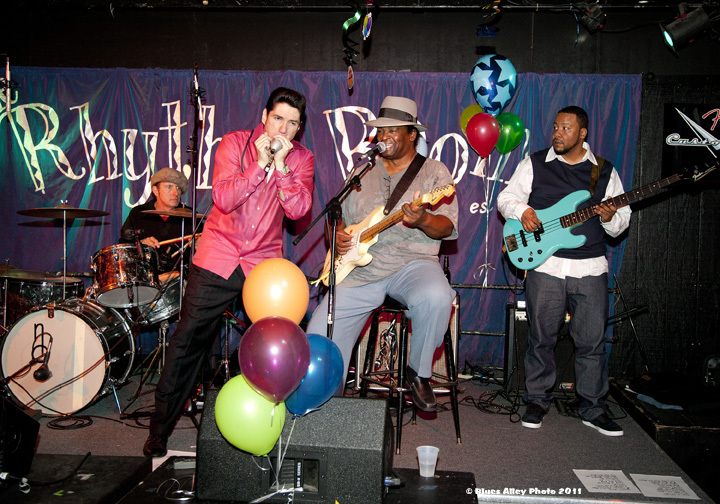 Here is a photo scrapbook of some of the musical highlights of the year in chronological order. 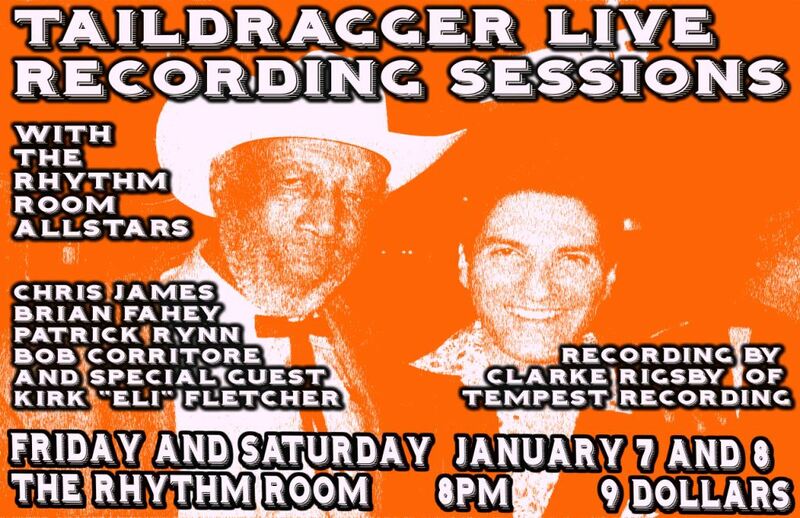 Bob Corritore brought Tail Dragger to The Rhythm Room for a live recording session on January 7th and 8th. 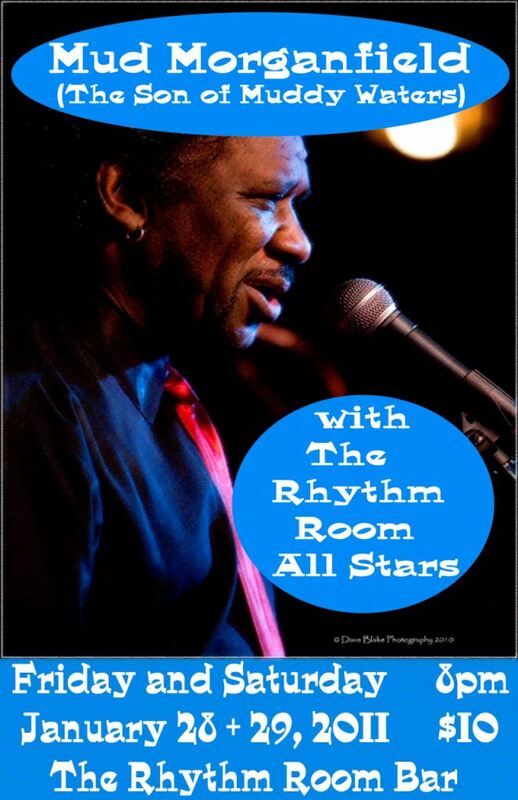 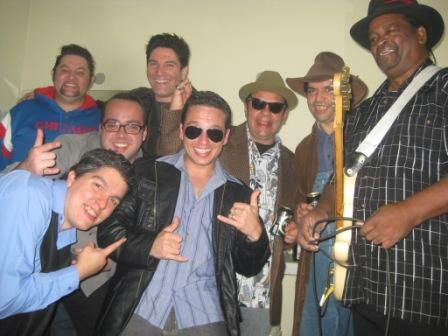 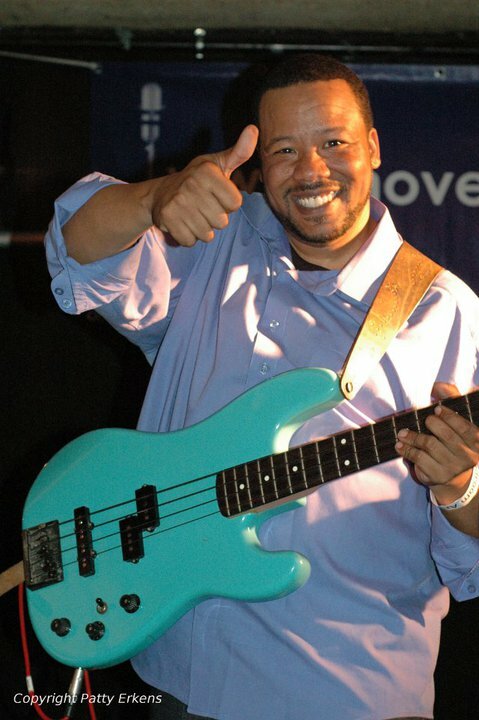 Tail Dragger was backed by the Rhythm Room All-Stars with special guest Kirk Fletcher. 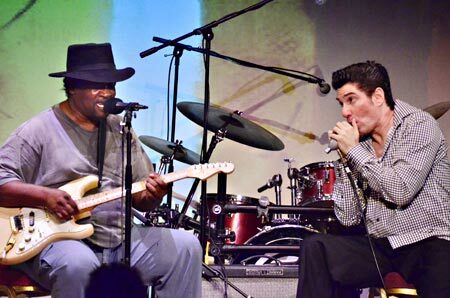 Some powerful Chicago Blues was played. 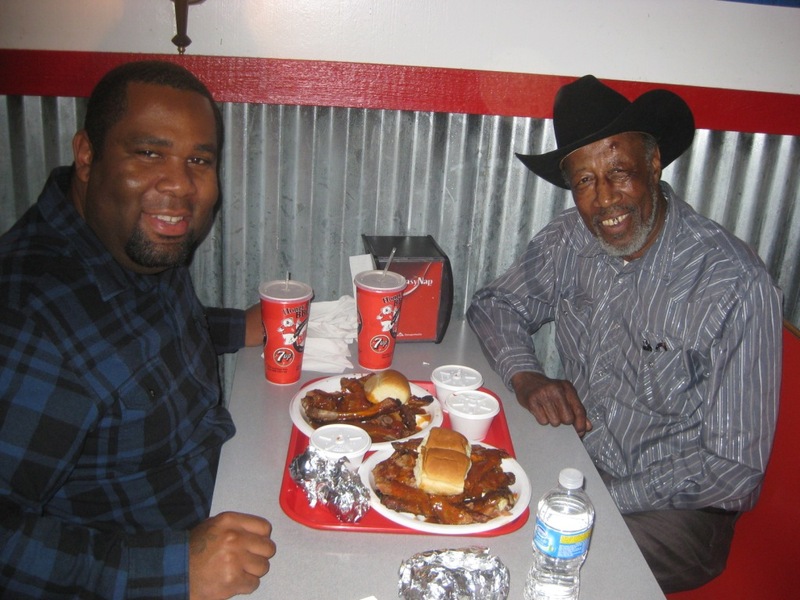 While visiting Phoenix, Bob took Tail Dragger and Kirk Fletcher to Honey Bear’s for some delicious barbecue! 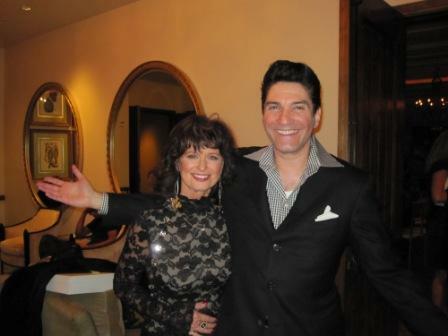 Jessi Coiter and Bob Corritore appeared for a celebrity filled charity fundraiser dinner benefitting ChildHelp USA on January 14th at the Paradise Valley Country Club. 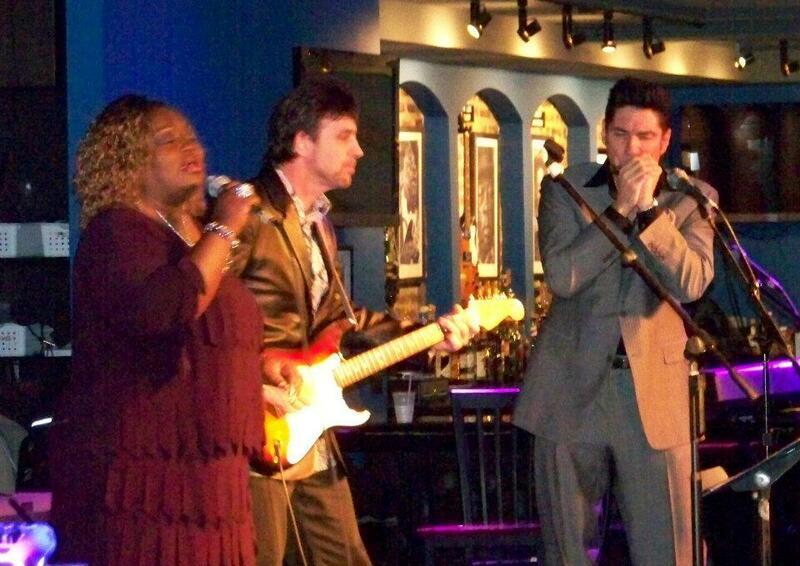 Quite a contrast to play with Tail Dragger the weekend before! 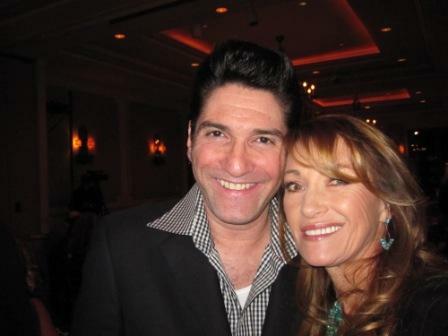 Bob met the lovely Jane Seymour at the ChildHelp USA fundraiser. 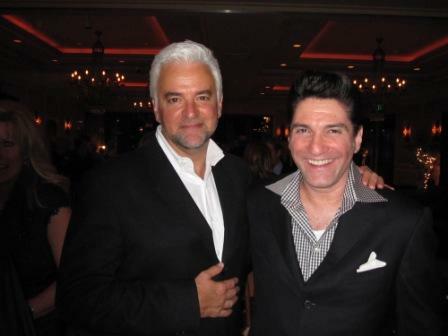 Bob also met John O’Hurley at the ChildHelp USA fundraiser dinner. 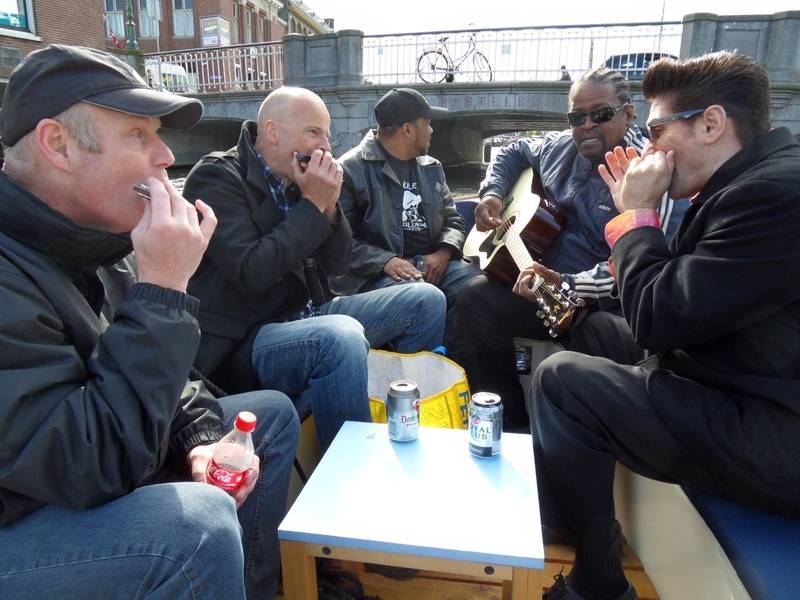 There were many interesting people that weekend. 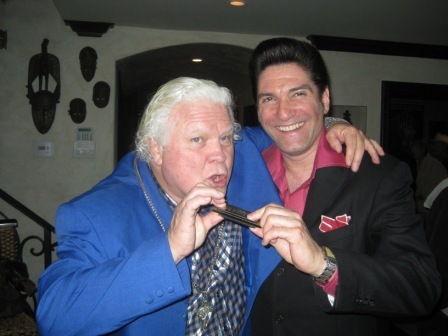 It was a great honor for Bob to meet the legendary Mickey Rafael (longtime harmonica player in Willie Nelson’s band) on Saturday, January 15th. 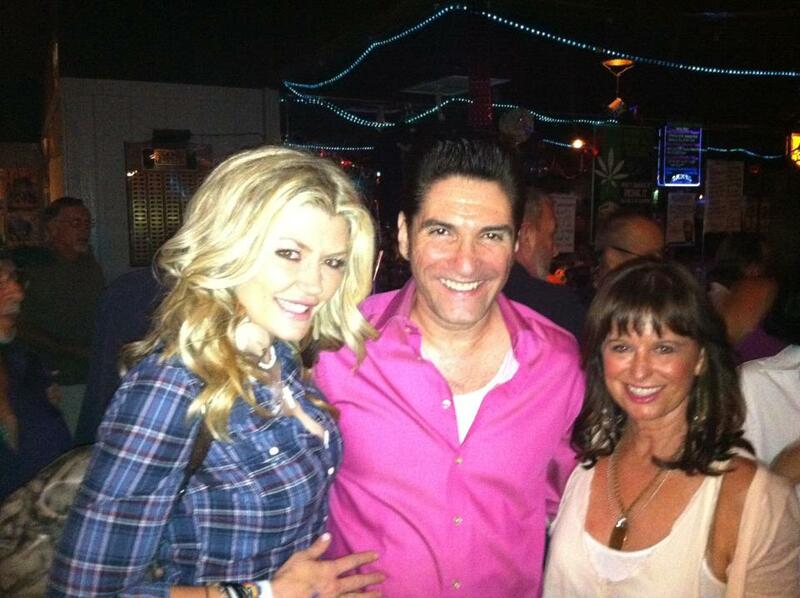 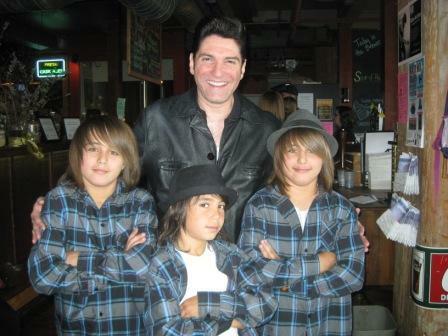 This was at the second night of the ChildHelp USA fundraiser. 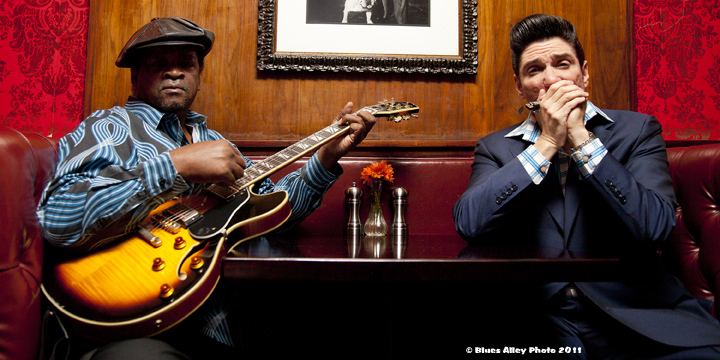 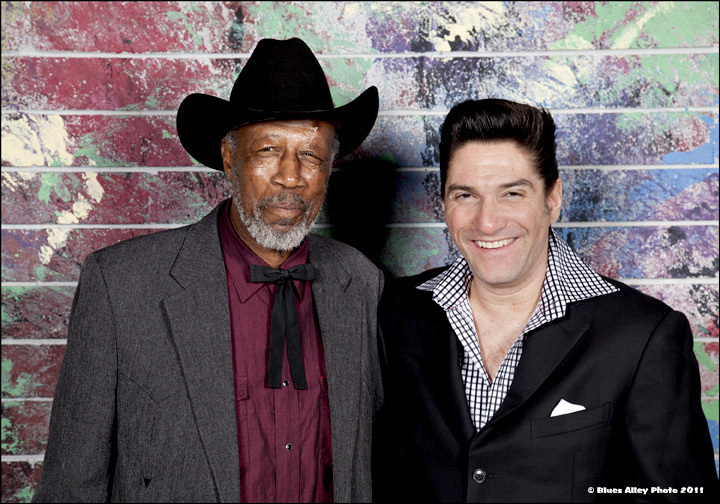 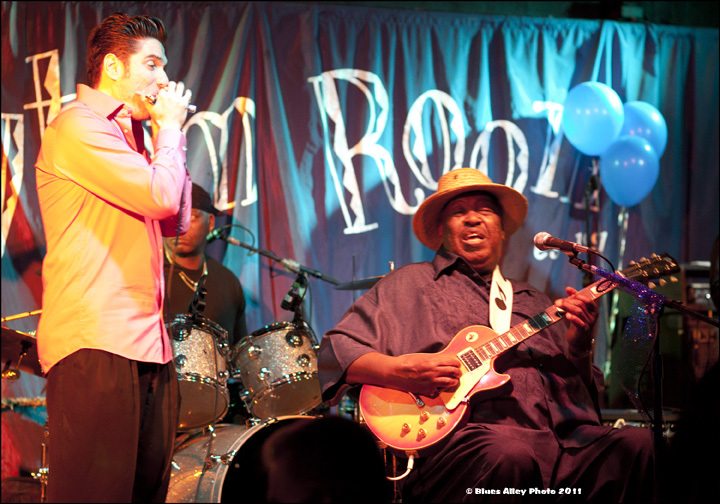 Mud Morganfield and Bob Corritore performed at The Rhythm Room in Phoenix on January 28th and 29th. 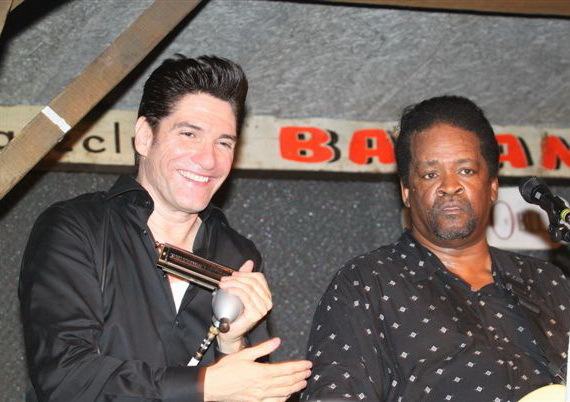 Gary was the recipient of a KBA award in the Blues Educator category for his Harmonikids educational program. 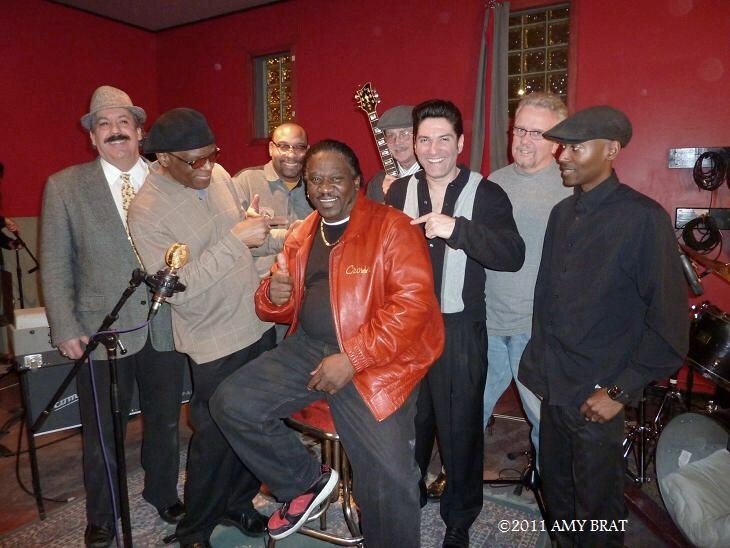 Bob Corritore and Mud Morganfield at Rat Trax Studios in Chicago, IL after completing the sessions for Mud’s CD. 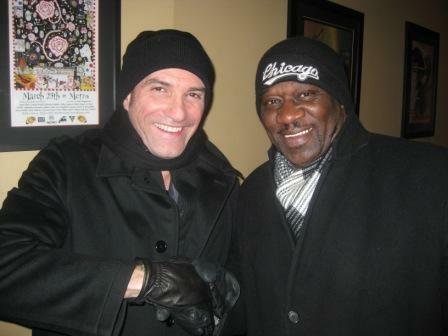 Note it was below zero weather during that time! 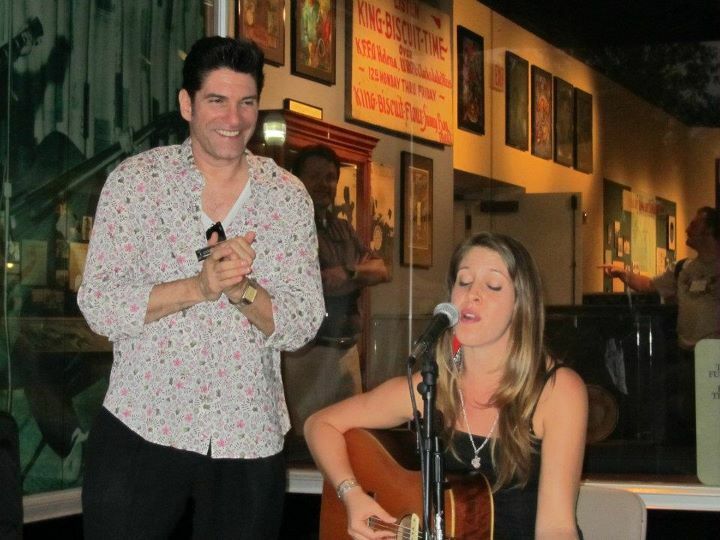 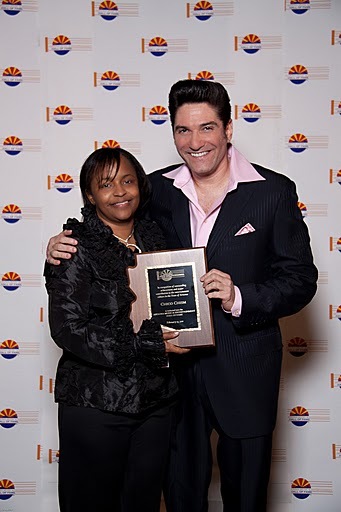 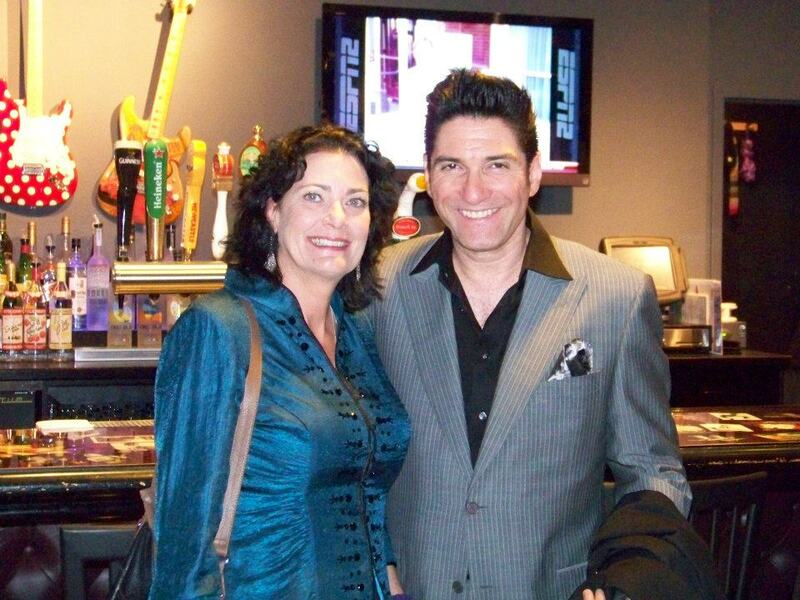 Audrey Donson (Chico Chism’s daughter) and Bob Corritore at the Arizona Musicians and Entertainment Hall of Fame induction ceremony on February 13, 2011 at the Orpheum Theatre in Phoenix. 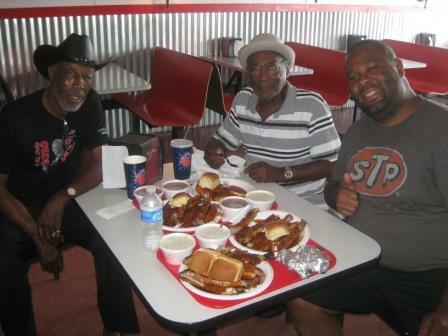 At this ceremony, Chico Chism was inducted. 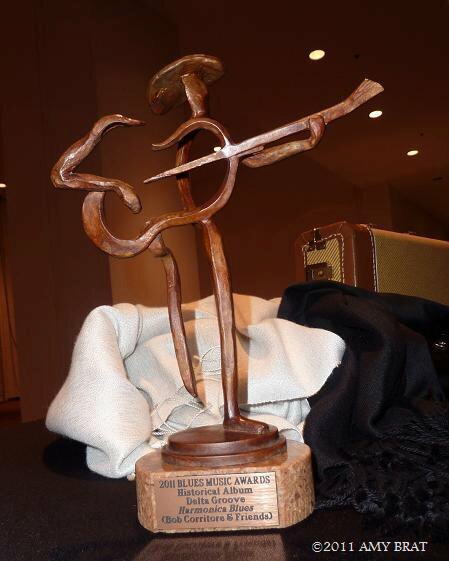 Bob was honored to present the trophy to Chico’s daughter. 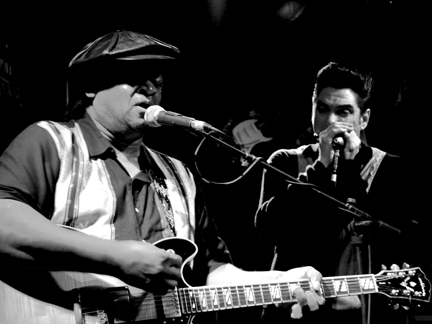 Chico was a major player in the Phoenix blues scene until his passing in 2007. 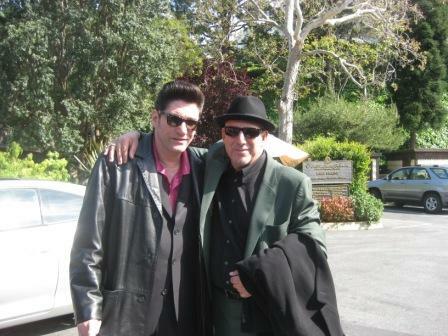 Bob Corritore and Randy Chortkoff on March 26th in Los Angeles after the funeral services for our friend Tom Leavey. 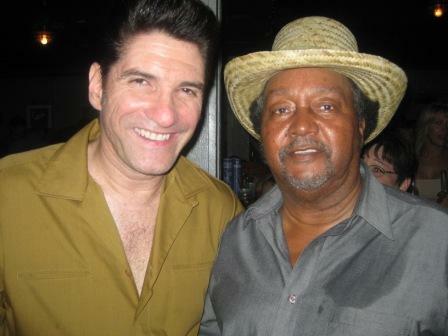 King Cotton and Bob Corritore at the repast for Tom Leavey at Randy Chortkoff’s house. 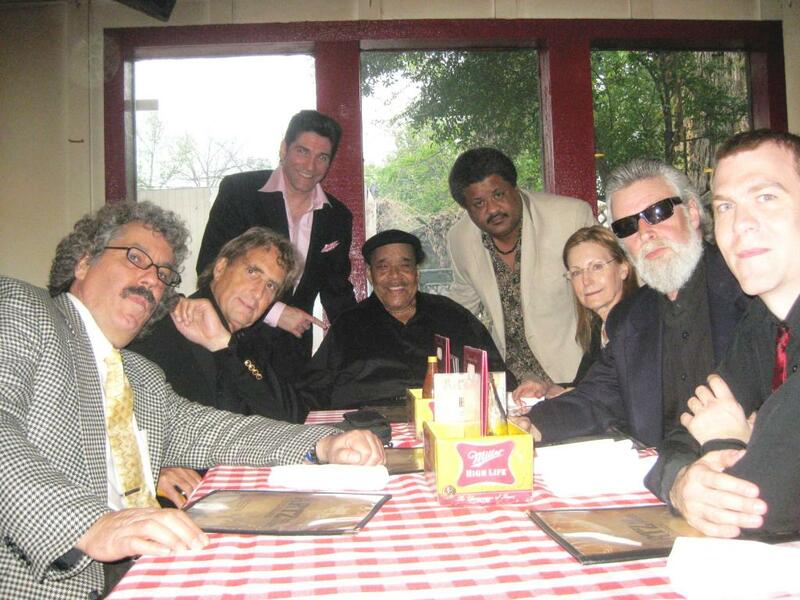 On March 28th, immediately after Pinetop Perkins’ funeral in Austin, Texas, a group of Pinetop’s close friends gathered at Artz Rib House for dinner to honor this great man. 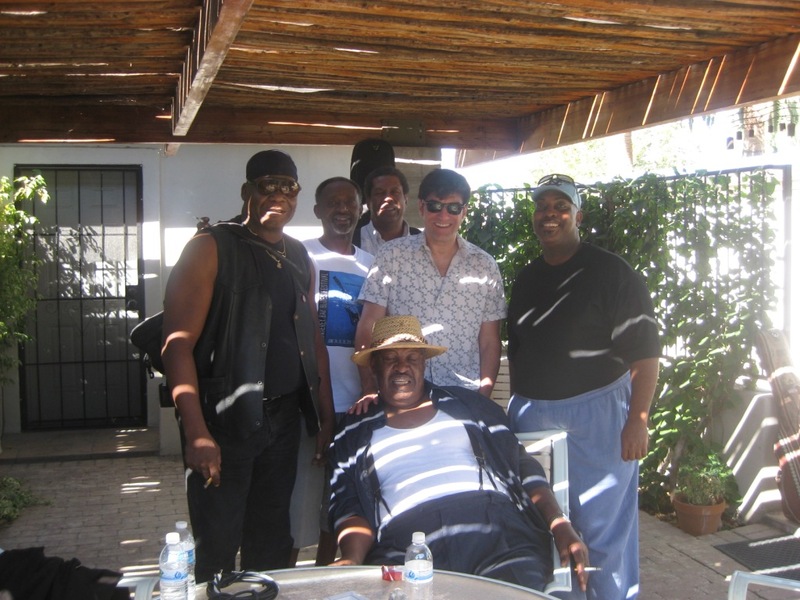 Included in this photo are (Left to Right) Barrelhouse Chuck, David Maxwell, Bob Corritore, James Cotton, Noel Neal, Jacklyn Hairston (James Cotton’s wife), Paul Oscher, and Little Frank, There was unspoken love and respect for Pinetop that filled this group’s collective consciousness. 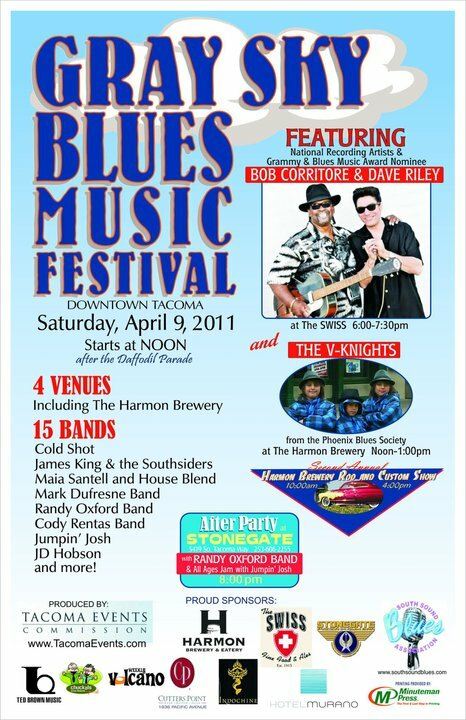 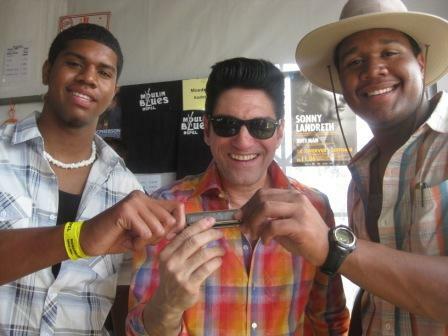 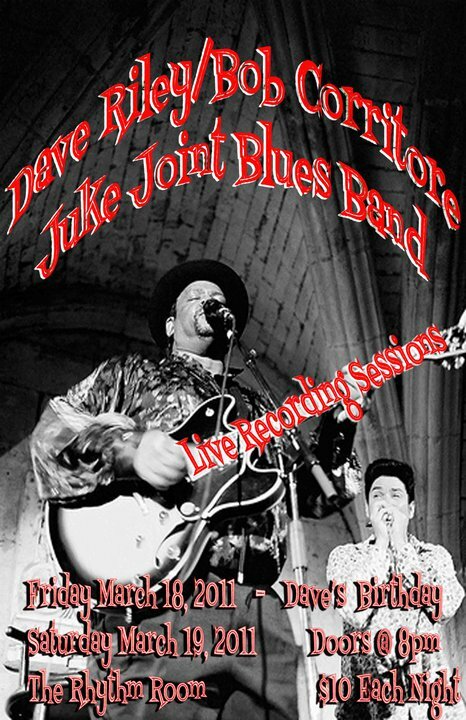 On April 2nd, Dave Riley & Bob Corritore headlined the Old Town Blues Festival in Cottonwood, AZ. 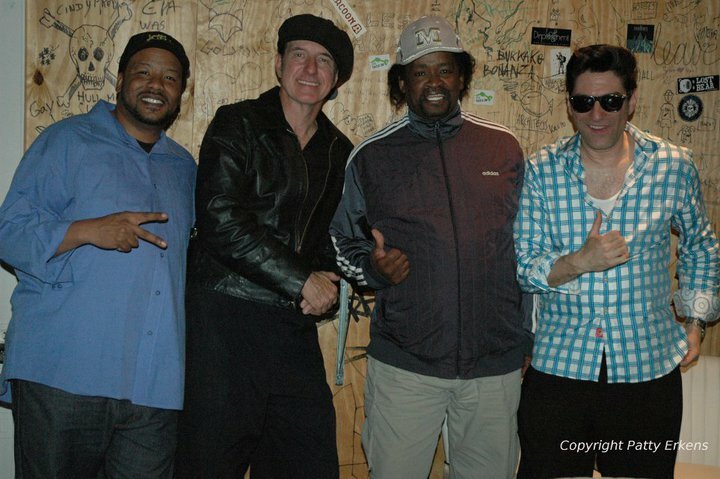 Dave and Bob with our wonderful pick up rhythm section right before our set at the Gray Sky Blues Festival on April 9th. 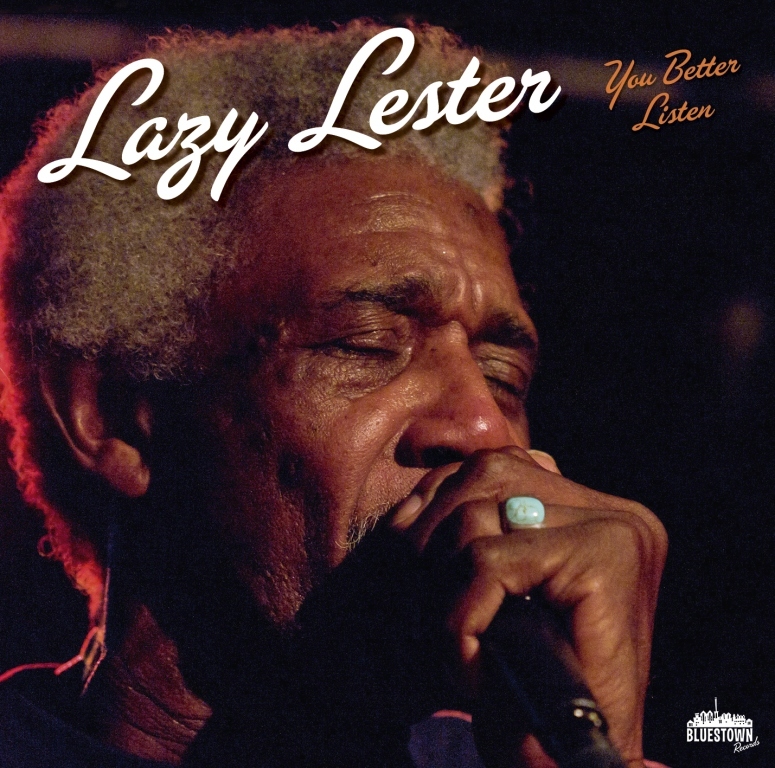 Bob Corritore was honored to be asked to write the liner notes for Lazy Lester’s You Better Listen, which was released in early 2011 on the Bluestown label from Norway. 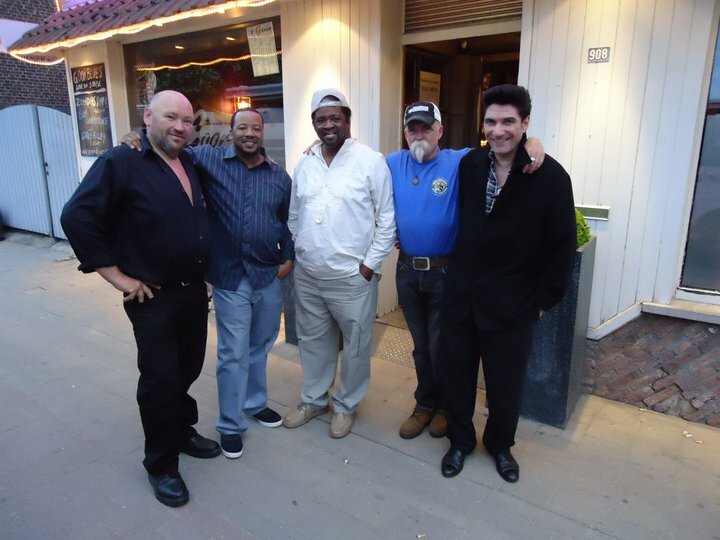 Thanks Jostein Forsberg. 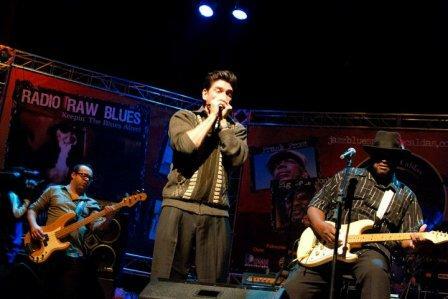 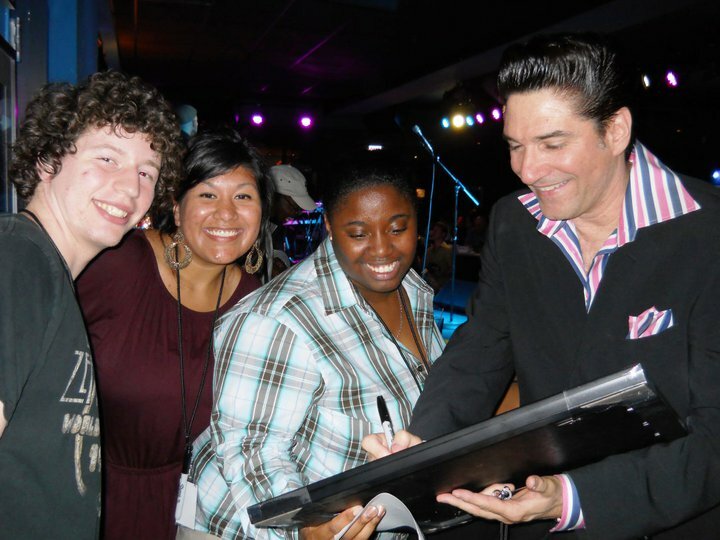 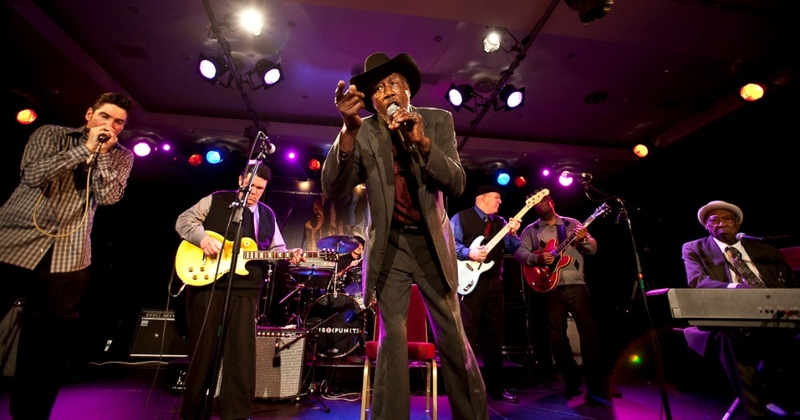 On May 5th, The Blues Foundation hosted the 2011 Blues Music Awards Ceremony at the Cook Convention Center in downtown Memphis. 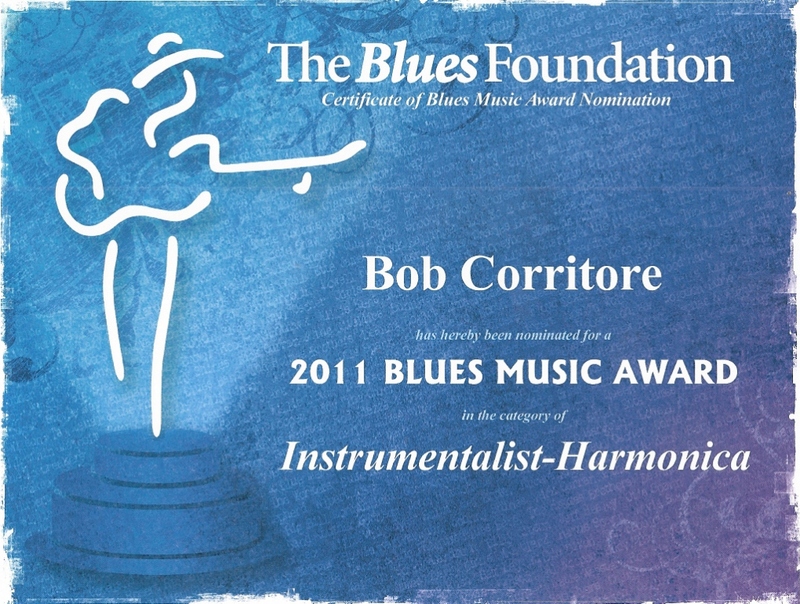 Bob Corritore & Friends / Harmonica Blues won a BMA that night for the “Historical Album” category! 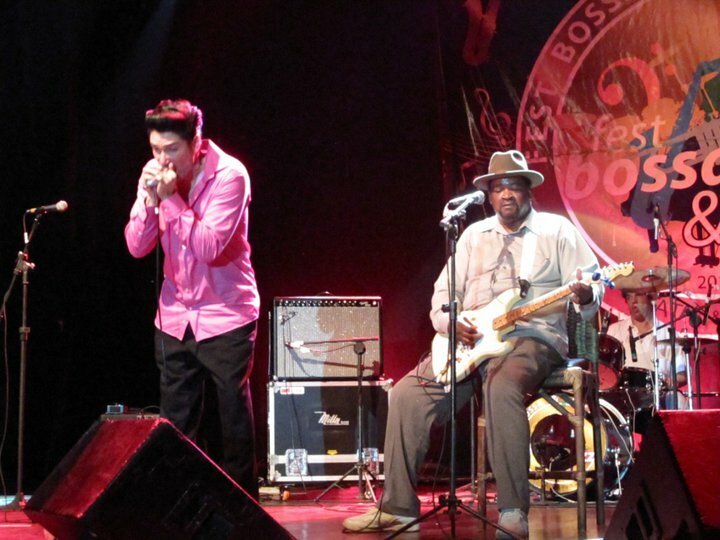 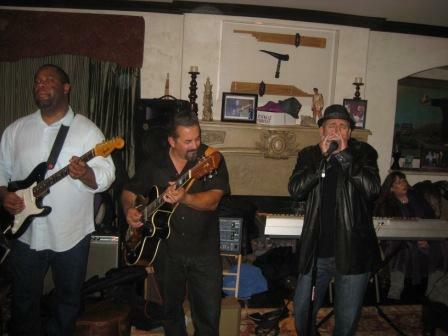 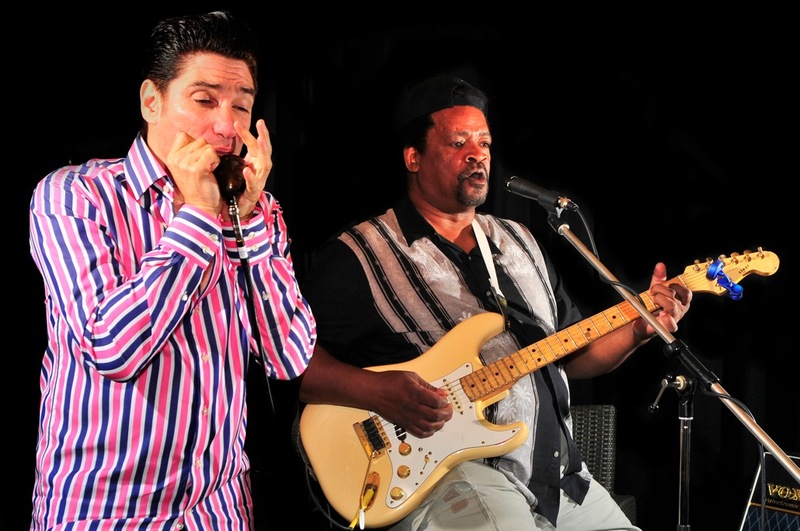 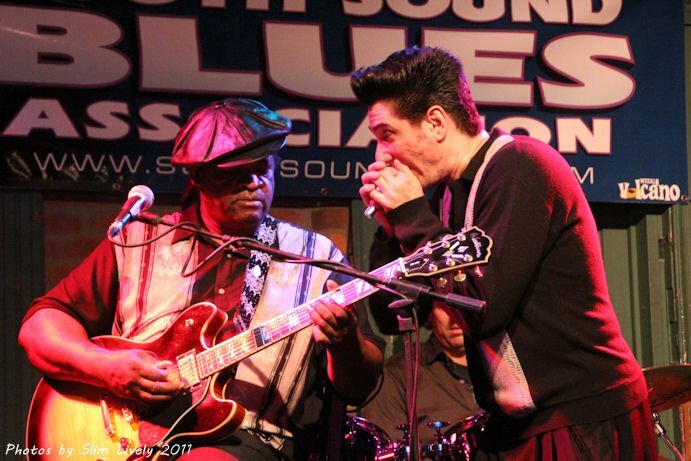 In addition to Bob Corritore & Friends / Harmonica Blues winning a Blues Music Award for “Historic Album”, Bob also received a BMA nomination under the “Instrumentalist – Harmonica” category. 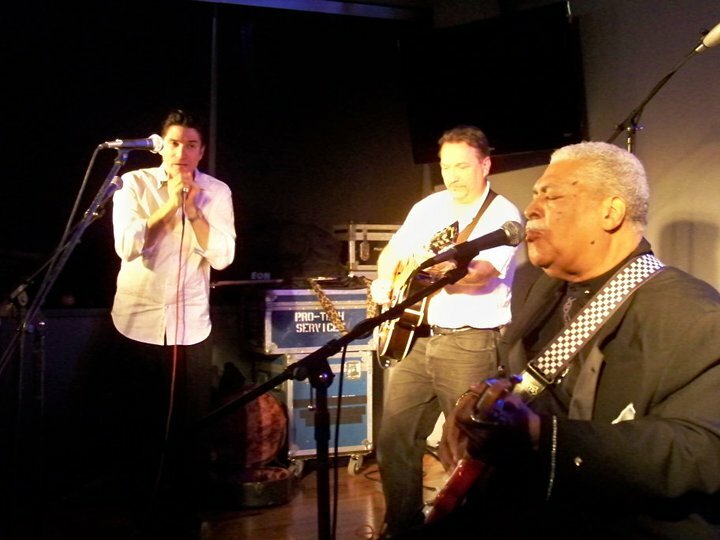 Also nominated were James Cotton, Kim Wilson, Paul Oscher, and Charlie Musselwhite. 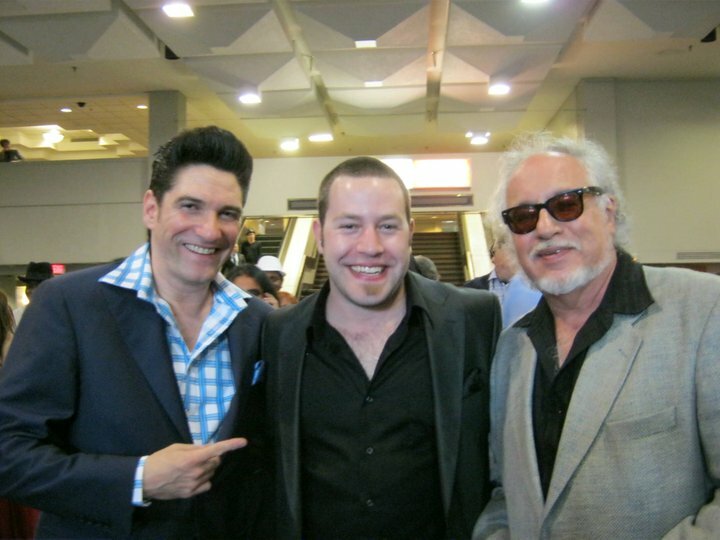 It was Charlie who would walk away with the win! 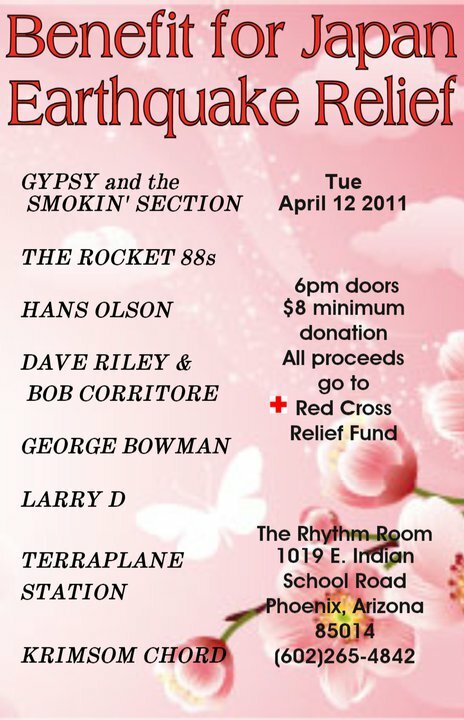 Here is the lovely nomination certificate. 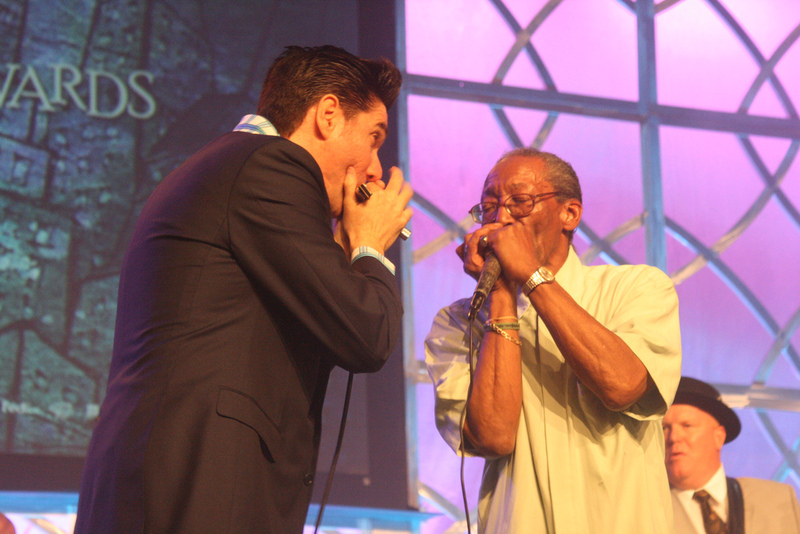 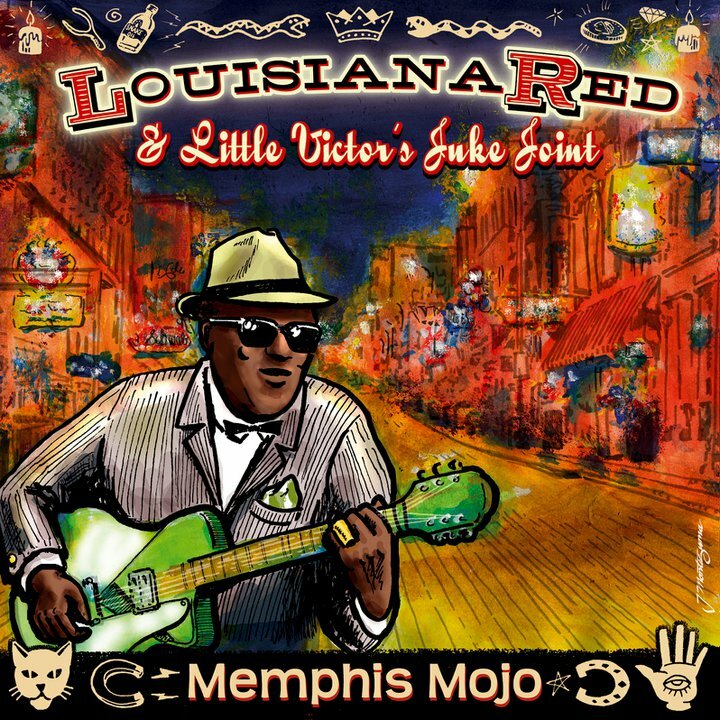 Bob Corritore and Willie “Big Eyes” Smith performed a tribute to Pinetop Perkins together at the 2011 Blues Music Awards, Cook Convention Center, Memphis on May 5th. 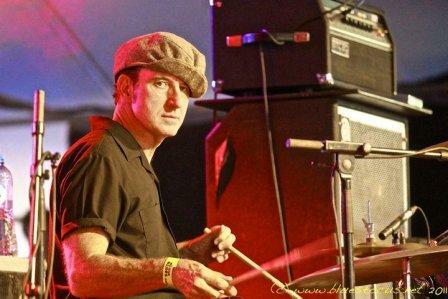 The all-star band on this song included Patrick Rynn (pictured above), Chris James, Eddie Shaw, David Maxwell, and Jimi Bott. 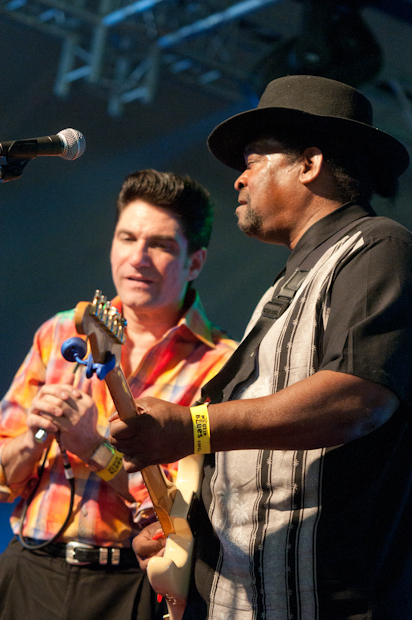 Bob Corritore & Dave Riley at the Moulin Ospel Blues Festival in Ospel, Holland on May 7th 2011. 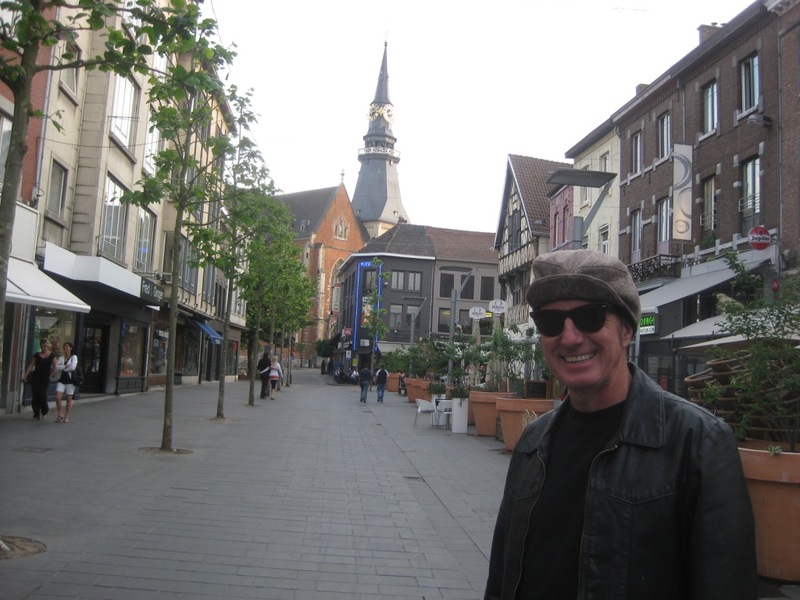 Note that Bob had just flew in from the BMAs with a 9 hour time difference. 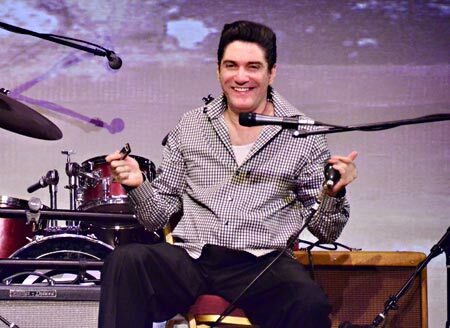 It was plane to stage with no sleep! 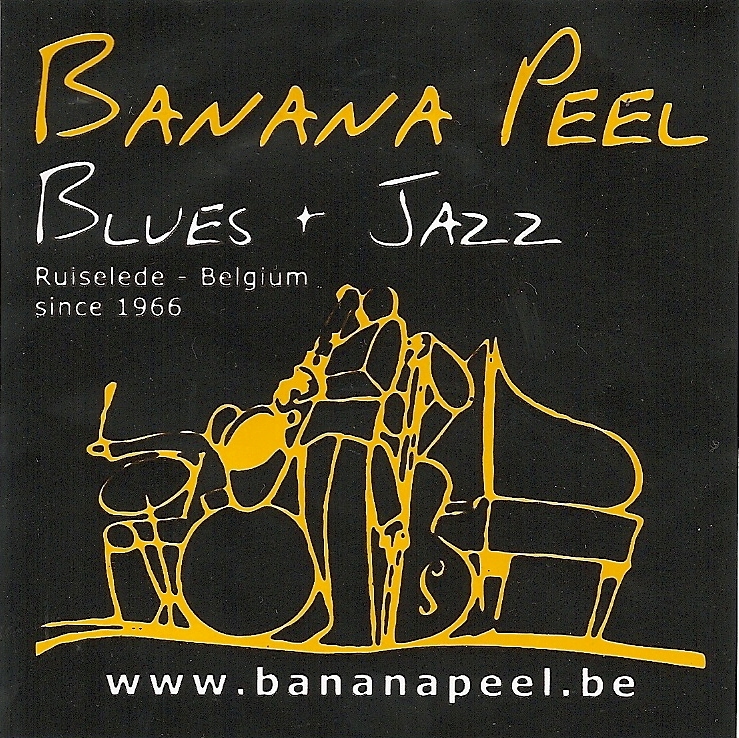 It was a pleasure to perform at the famous Banana Peel Club in Belgium on May 9th! 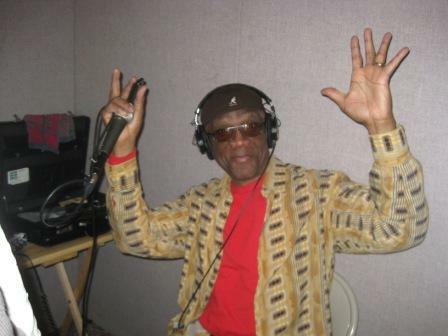 Bob produced half of the album and contributes harmonica on four selections. 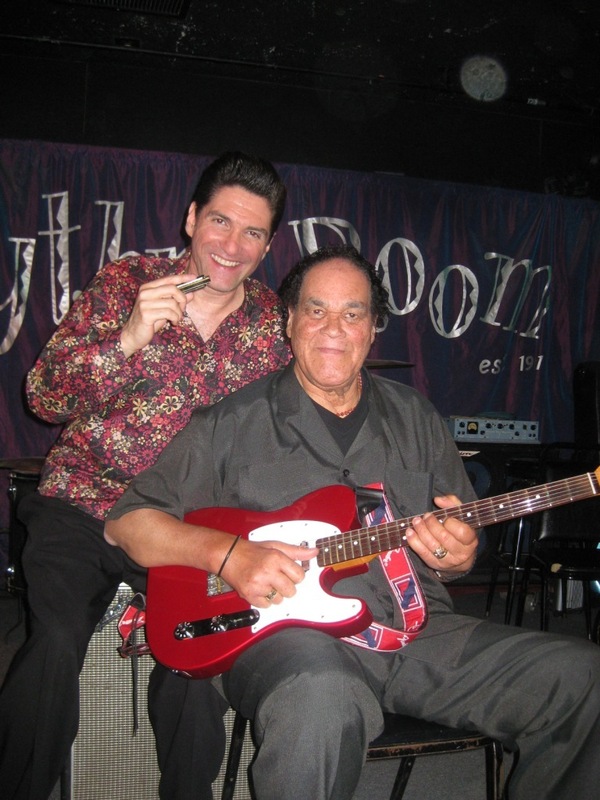 Red, who was visiting from his home of Hannover, Germany, played the weekend with The Rhythm Room All-Stars and was reunited with his longtime friend, Bob. 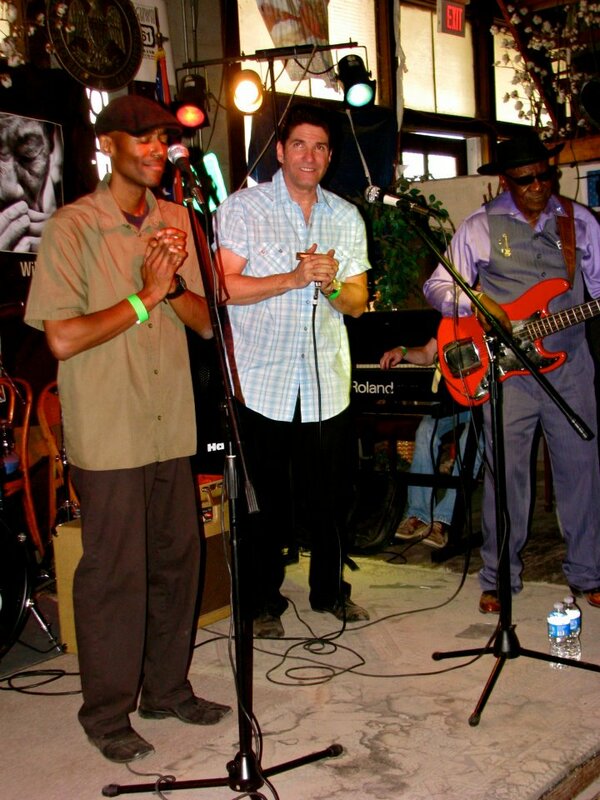 Bob performed as part of the Pinetop Perkins tribute set. 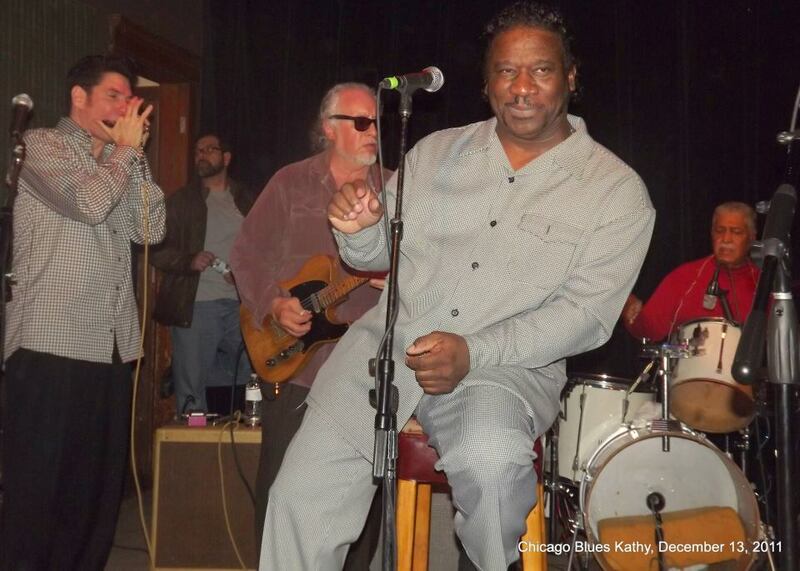 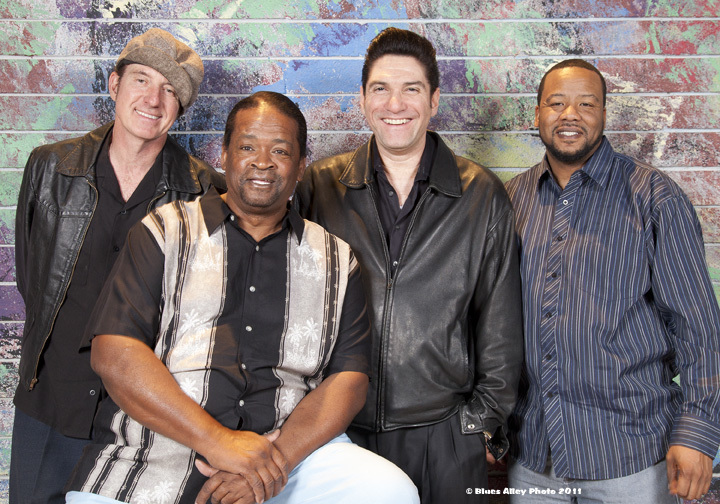 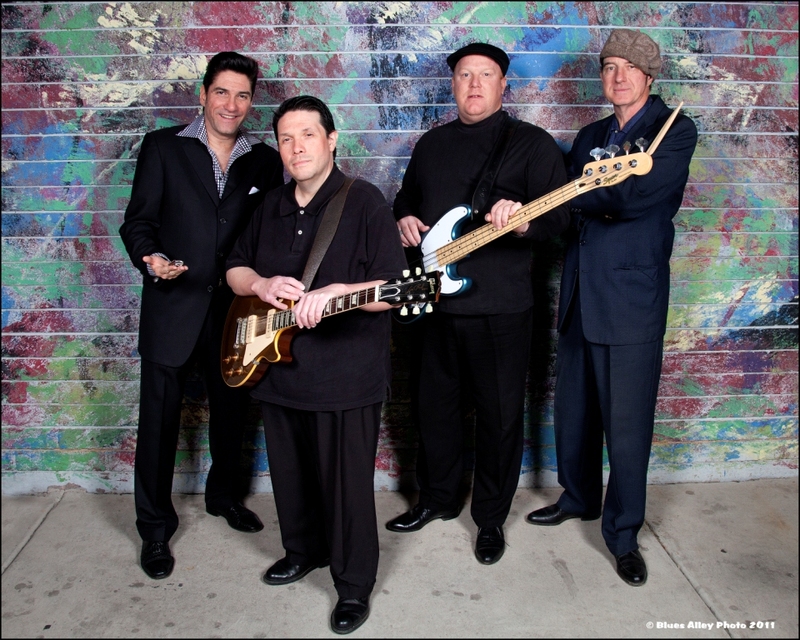 Bob Corritore appearing with The Mud Morganfield Band on Sunday, June 12 at the Front Porch Stage at the Chicago Blues Festival. 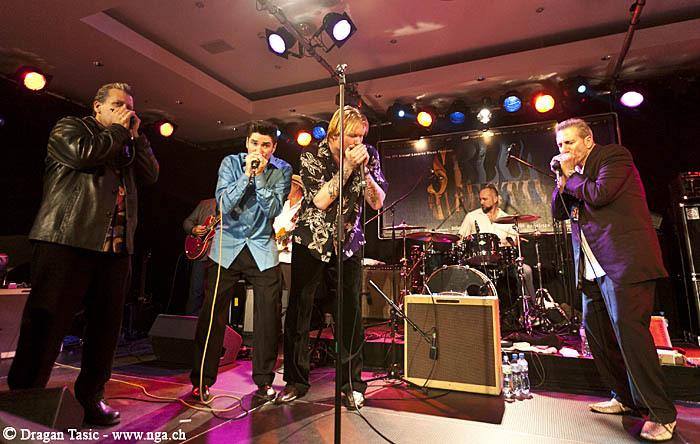 A spectacular performance with an all-star band. 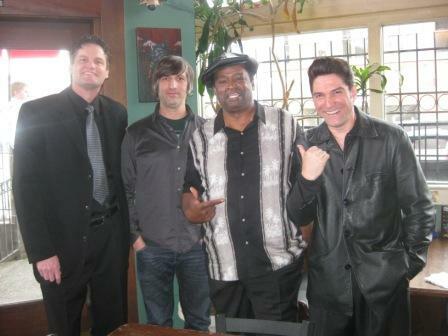 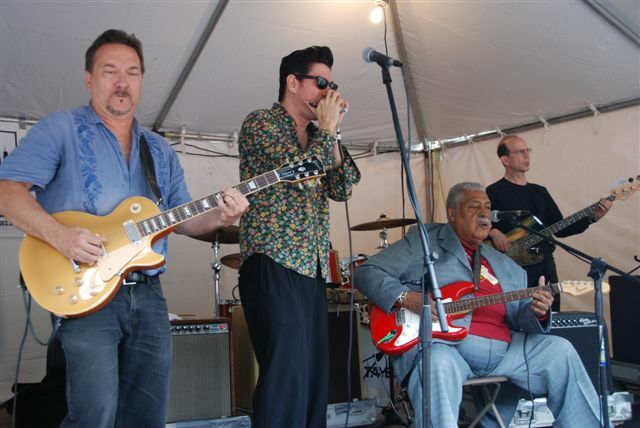 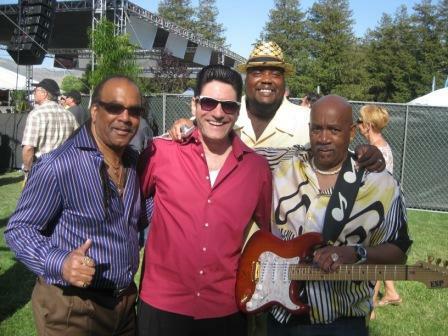 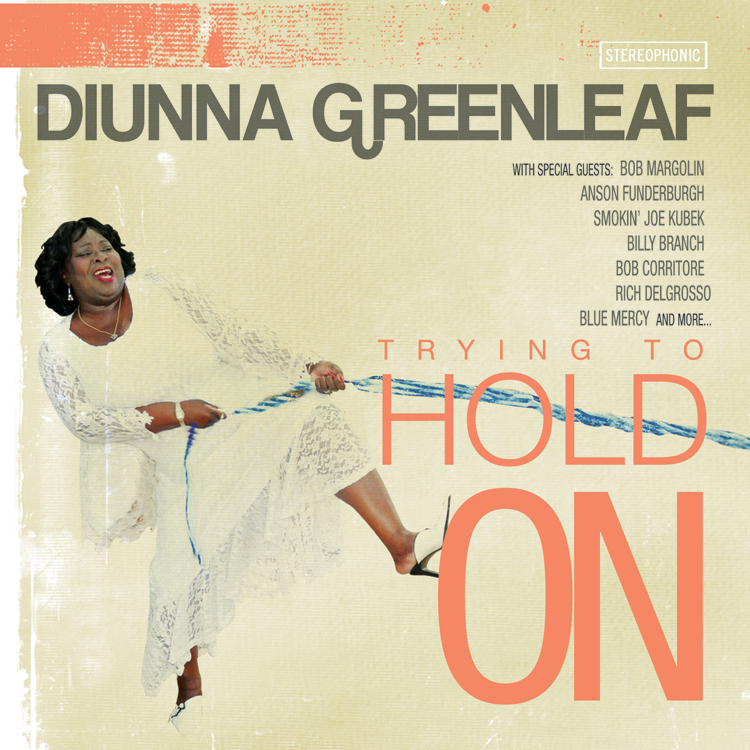 Pictured are Bob Corritore, Mud Morganfield, and E.G McDaniel. 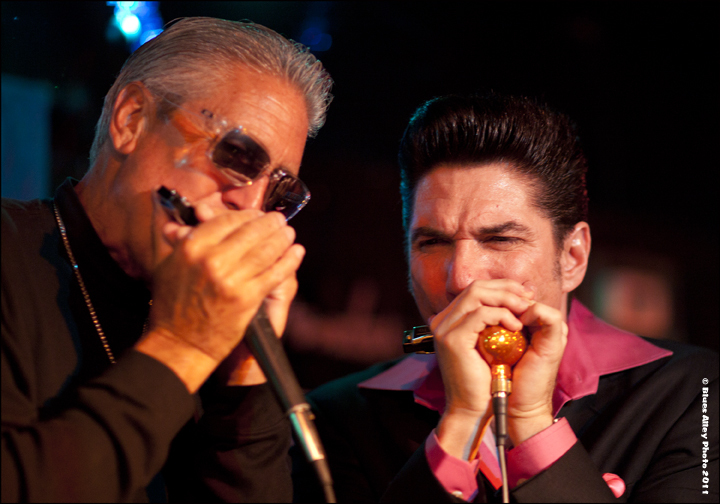 Also in the band were Kenny Smith, Barrelhouse Chuck, Billy Fynn, Rick Kreher, and Harmonica Hines, who split the harp chores with Bob. 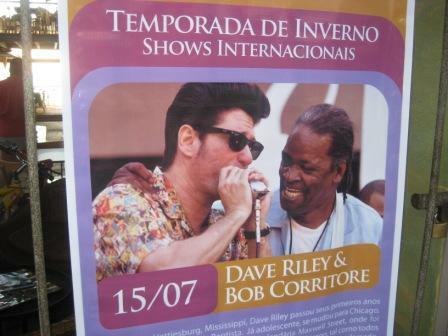 Morry had Bob as a featured guest on his gig that night. 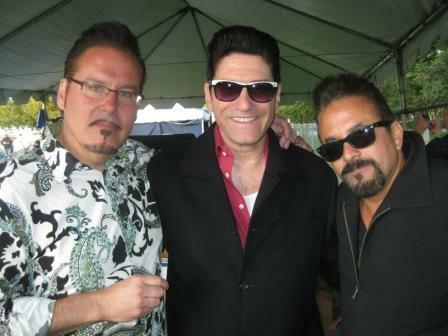 Some dear, longtime friends, not to mention all great musicians. 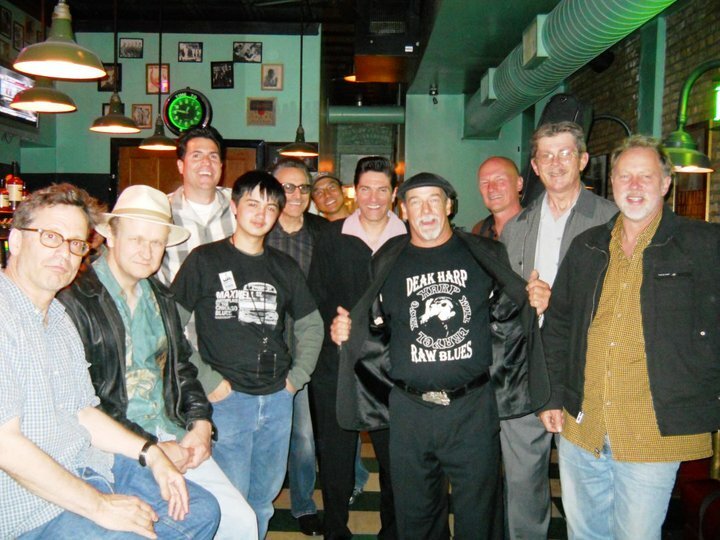 Dave Waldman, Joe Filisko, Morry Sochat, Jeffrey Justice, Rick Estrin, Shoji Naito, Bob Corritore, Deak Harp, Jim St. Marie, Billy Fynn, Mark Cihlar. 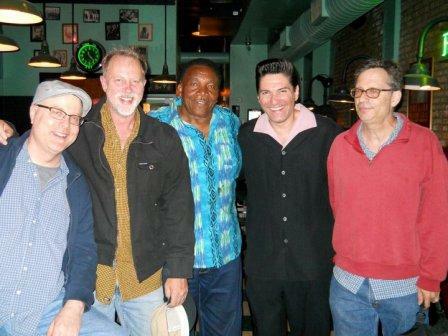 Morry Sochat & The Special 20s hosted a wonderful show at Smoke Daddy with Billy Flynn and Bob Corritore as special guests, with all these great players showing up. 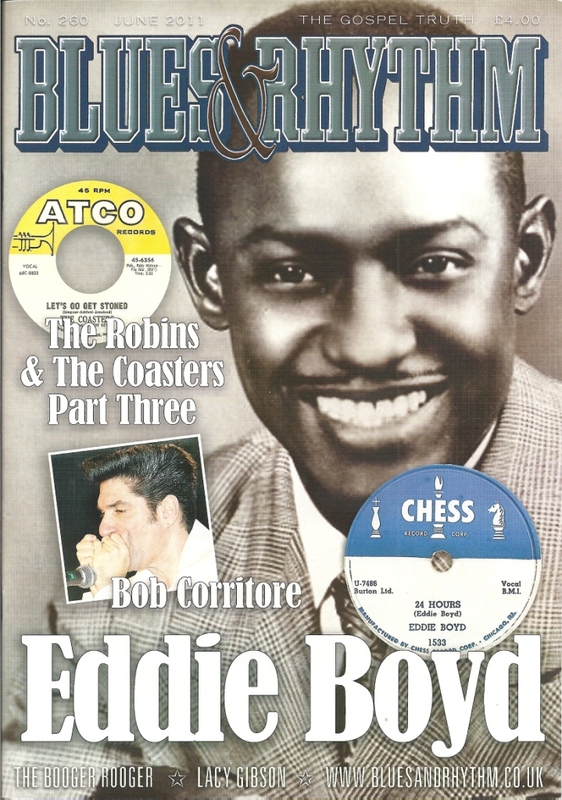 Blues & Rhythm Magazine From the UK Featured a Bob Corritore Interview With a Cover Shot in Their June Issue! 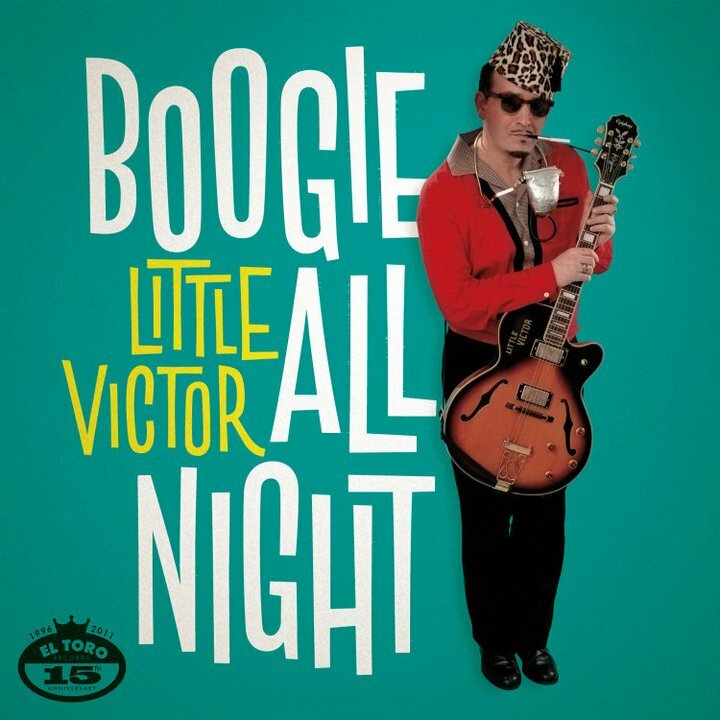 This was released in the fall of 2011. 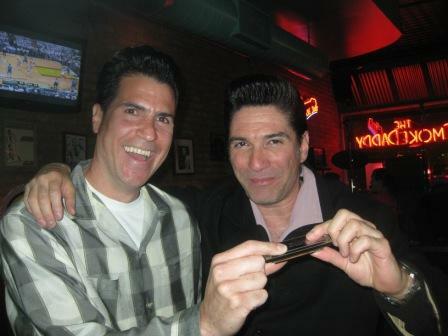 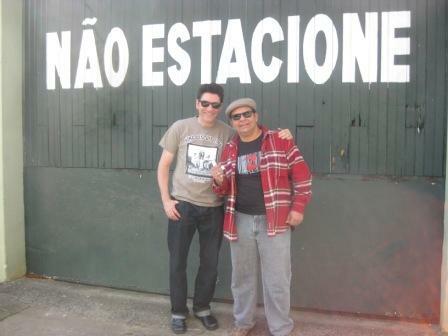 Little Victor produced the album, and Bob Corritore plays harmonica on six tracks! 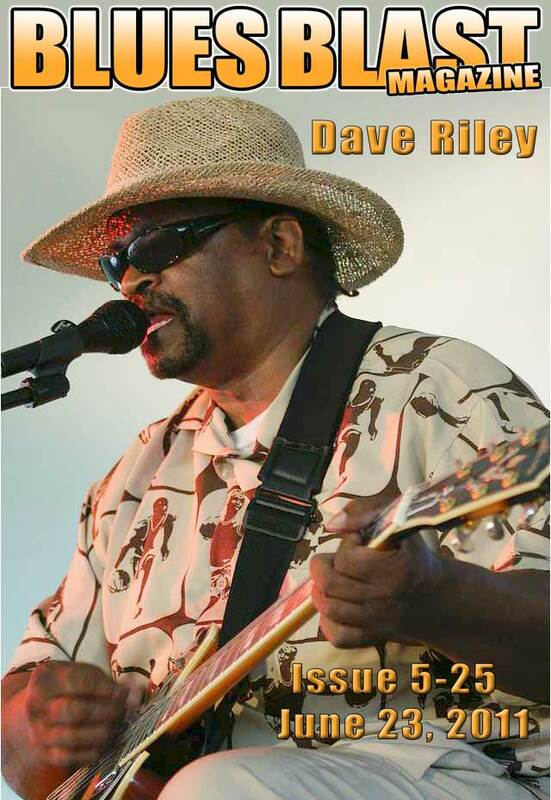 Dave Riley was the cover story of the June 23rd issue of Blues Blast Magazine! 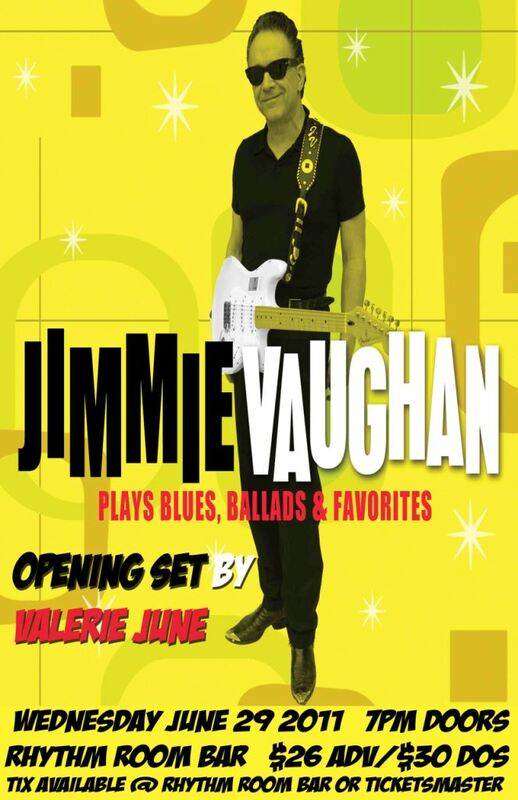 Valerie opened for Jimmie Vaughan with Bob joining her for the second part of her set. 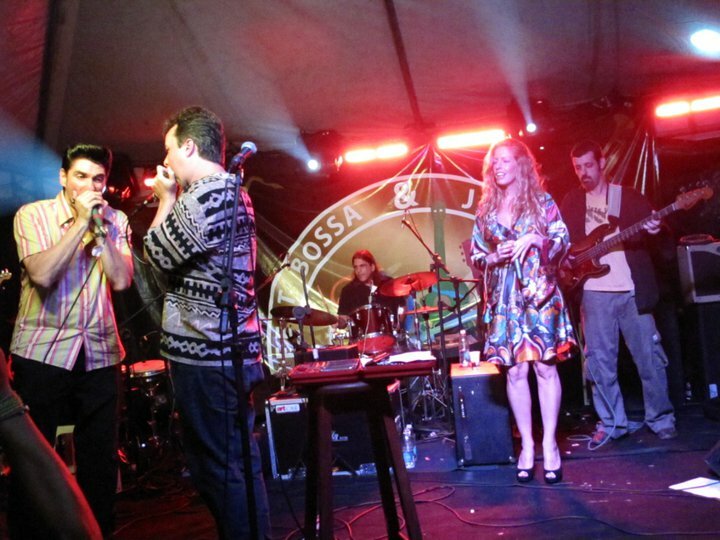 Bob Corritore was called onstage by Brazillian harp master Jefferson Goncalves with Taryn Szpilman on vocals and Jefferson’s fine band. 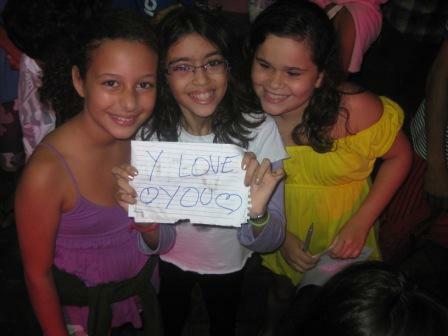 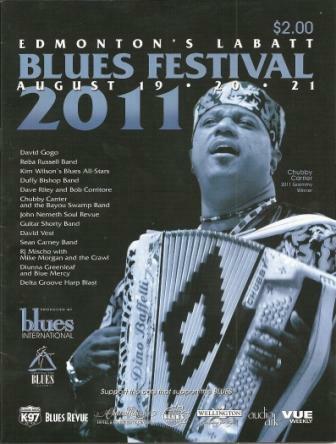 Wonderful performances were recorded on that day and again on August 1st. 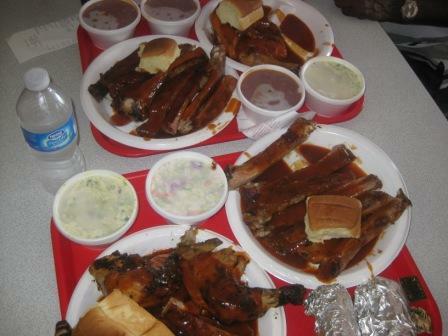 After a day of recording on July 28th, it was time for Honey Bear’s Barbecue. 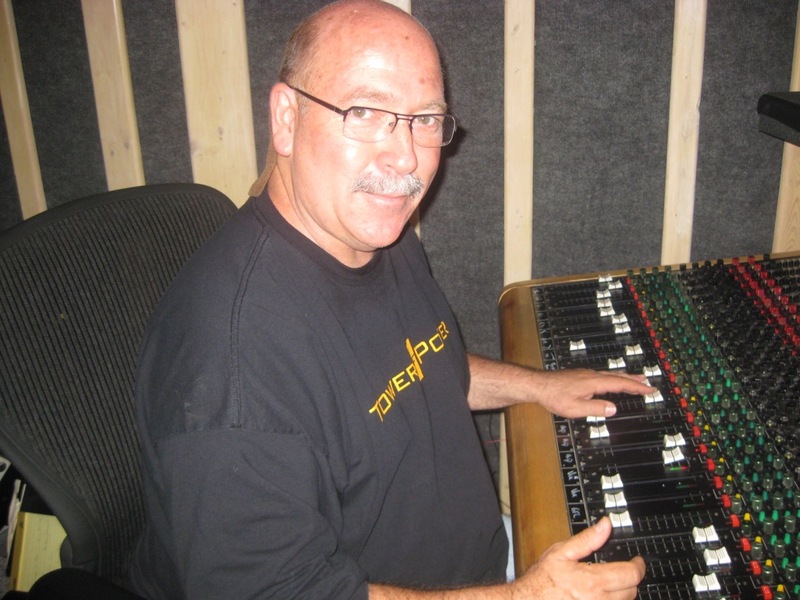 Bob and Clarke were mixing Amanda’s chosen selections from Amanda’s Roller Coaster in the studio that day. 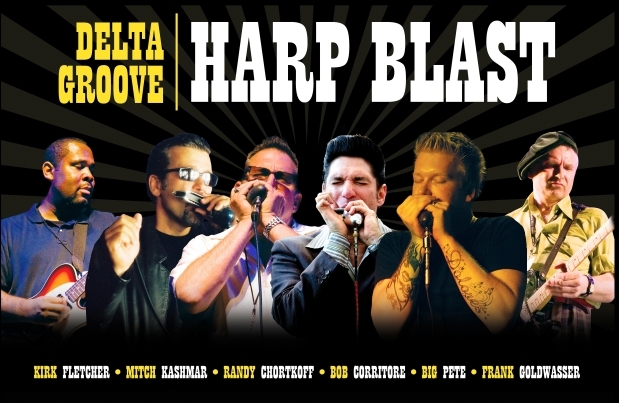 The Delta Groove Harp Blast debuted at the Edmonton’s LaBatt Blues Festival in Alberta, Canada, headlining the third day of the festival on Sunday, August 21st. 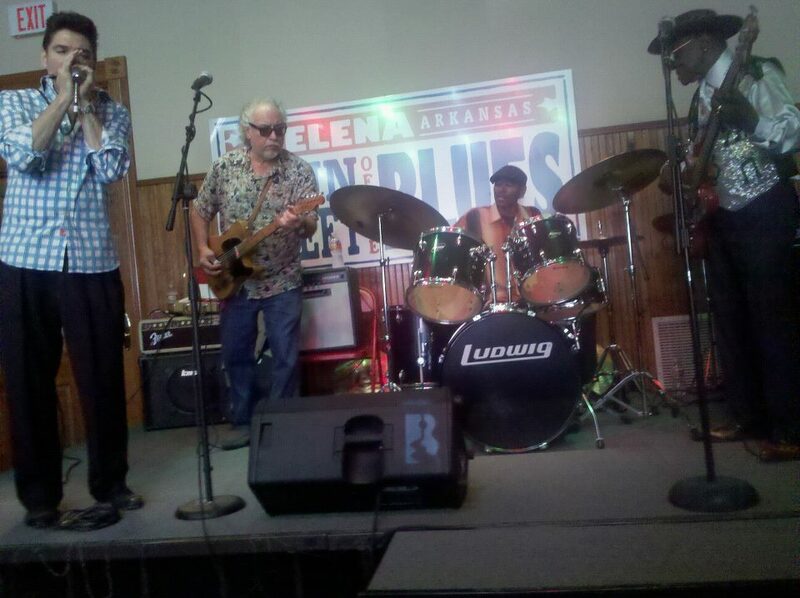 It was an amazing set and a memorable close to a great weekend of blues music! 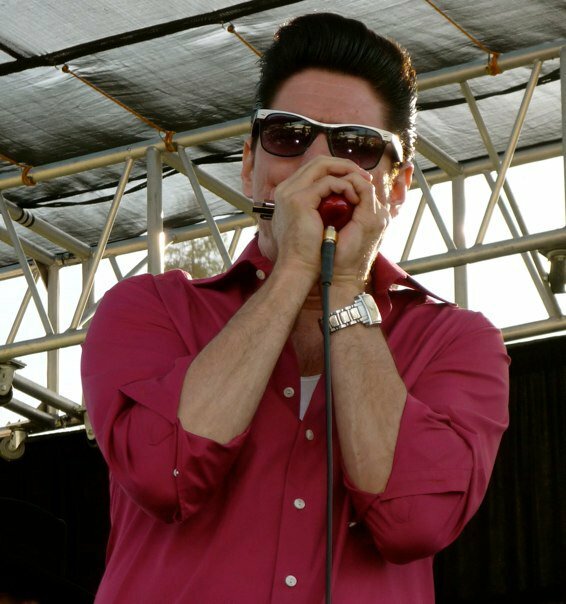 Frank Goldwasser is the guitarist shown above. 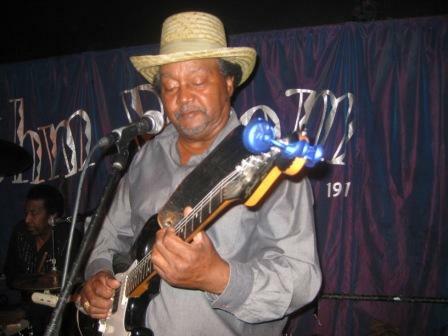 Bob went to see his old friend and was called up on stage at five different points to play some Jimmy Reed, Elmore James, and Buster Brown songs. 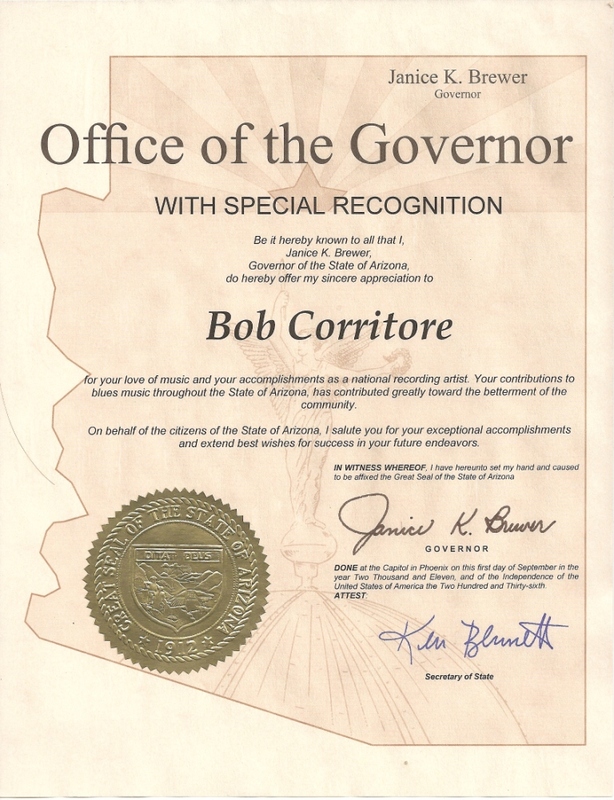 The record features sides recorded in Phoenix with a guest appearance by Bob Corritore on one cut. 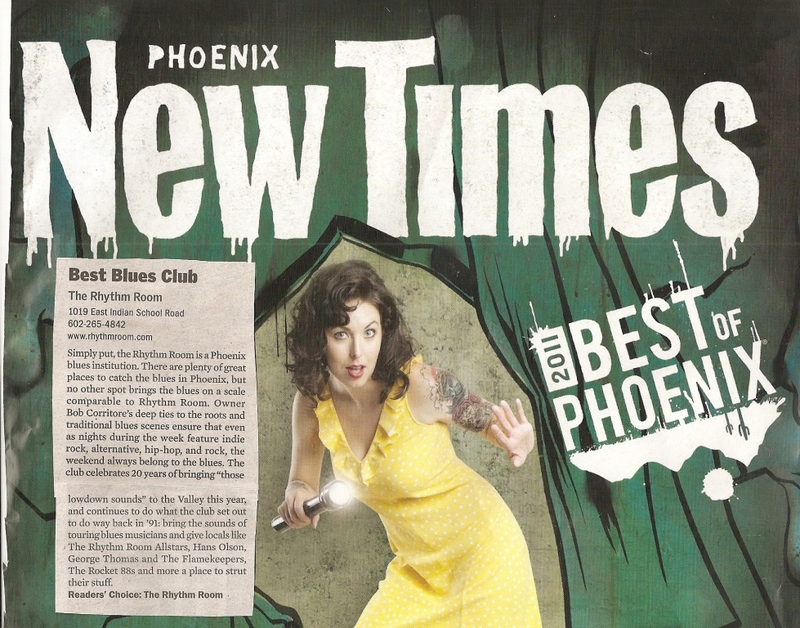 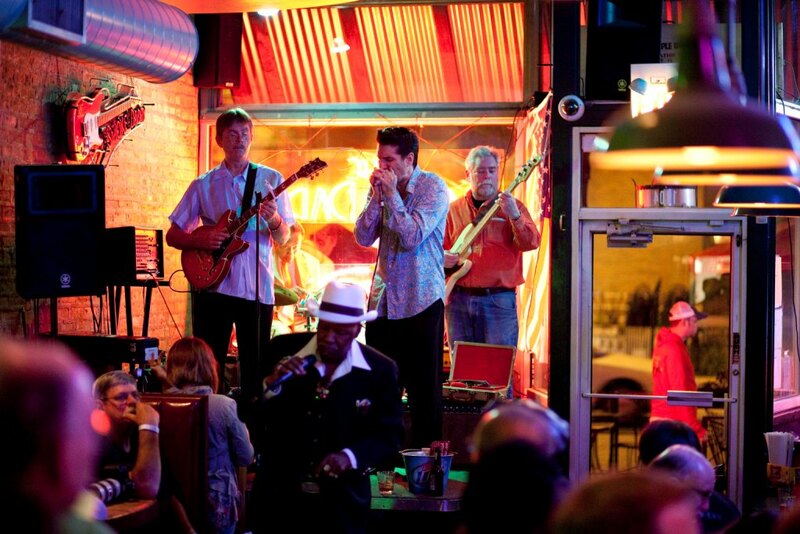 In September, The Phoenix New Times Critics & Readers Chose The Rhythm Room as “Best Blues Bar” for the 2011 Best of Phoenix Awards! 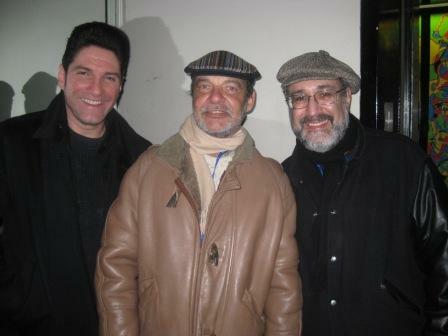 The 18th was the actual 20th anniversary of the club’s opening day! 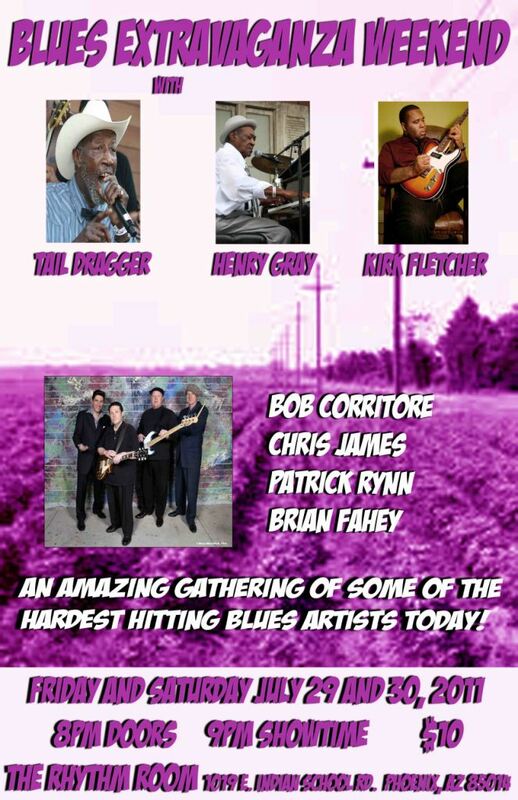 Tommy Castro called Bob to join him on a Jimmy Reed number on September 16th, the opening day of the three day Rhythm Room 20th Anniversary celebration. 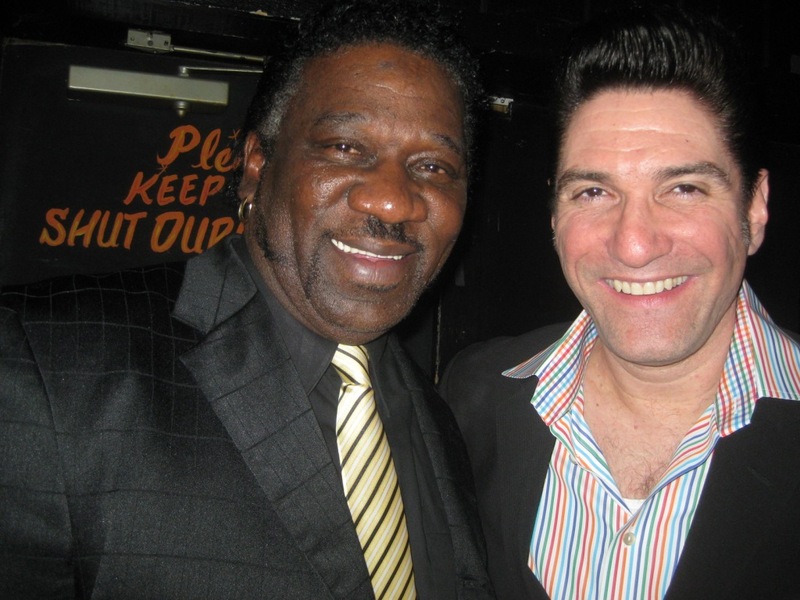 This night was billed as Bob Corritore & Friends, and also included Mud Morganfield, Bob Margolin, Dave Riley, Billy Flynn, Barrelhouse Chuck, Johnny Rapp, Mookie Brill, and Brian Fahey. 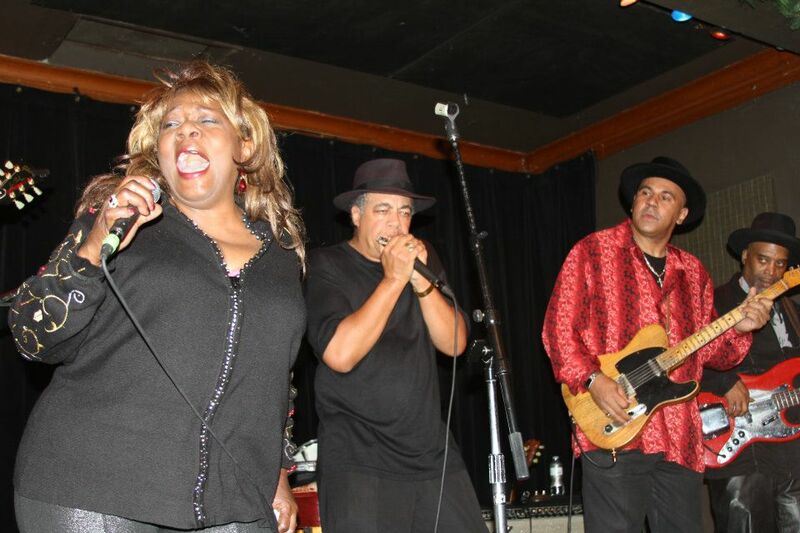 The night also served as an impromptu memorial tribute to Willie “Big Eyes” Smith, who passed away just days before. 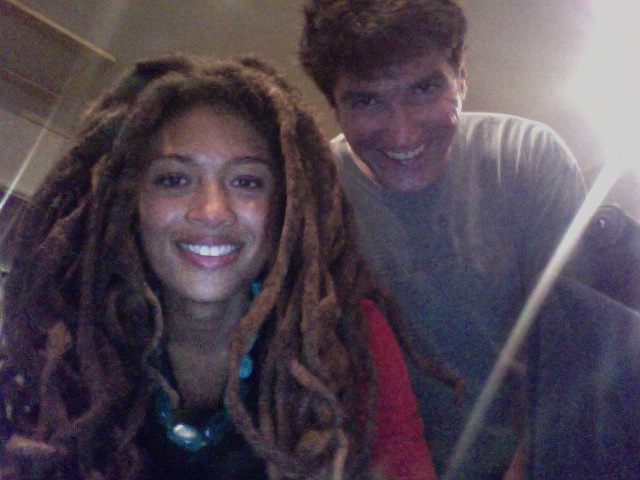 The Rhythm Room could not run smoothly without it’s guardian angel! 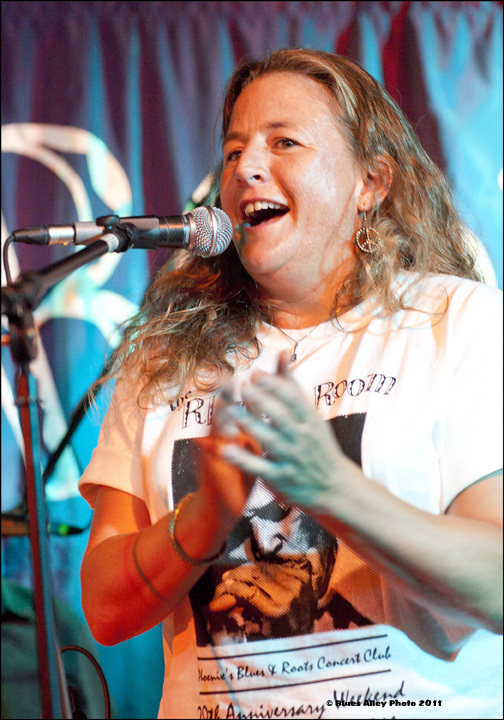 Here is Mona Lisa Watkins, the general manager of The Rhythm Room, making announcements on September 17th at The Rhythm Room 20th Anniversary party. 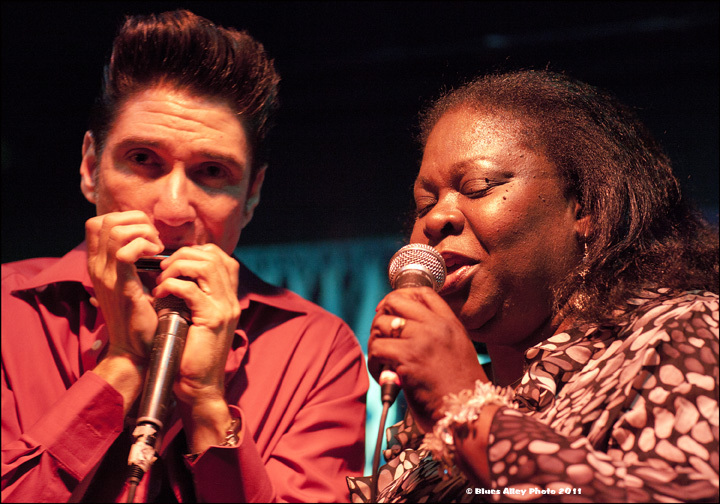 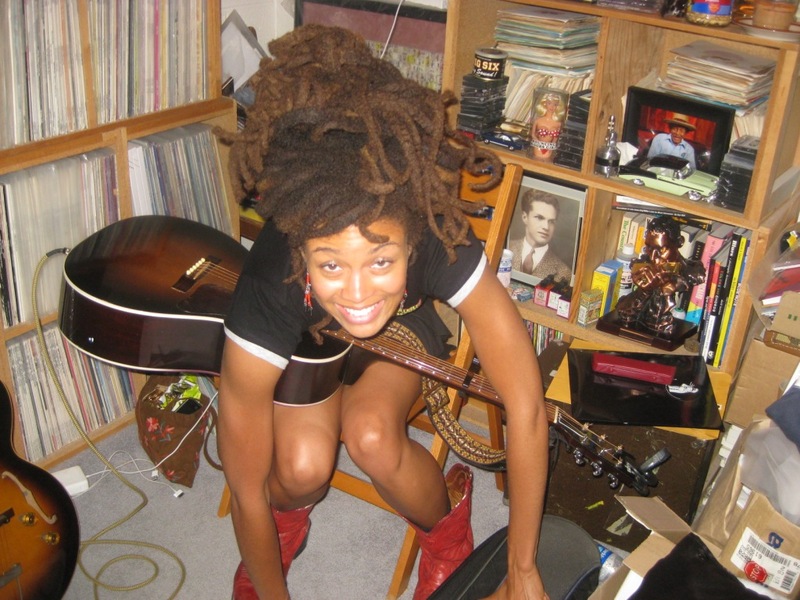 Mona has been with The Rhythm Room for 15 of those years! 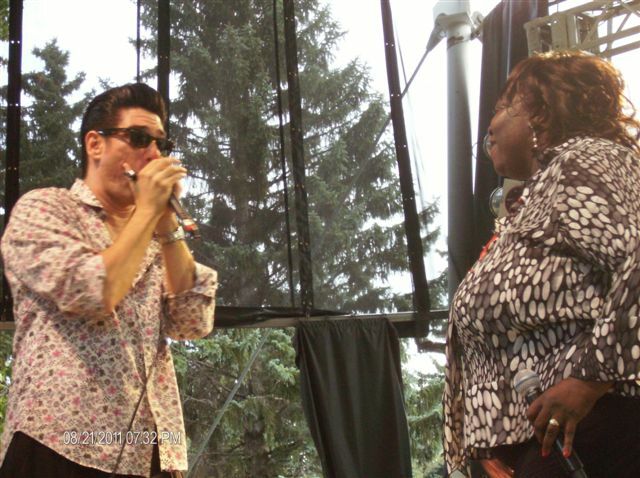 Thanks Mona! 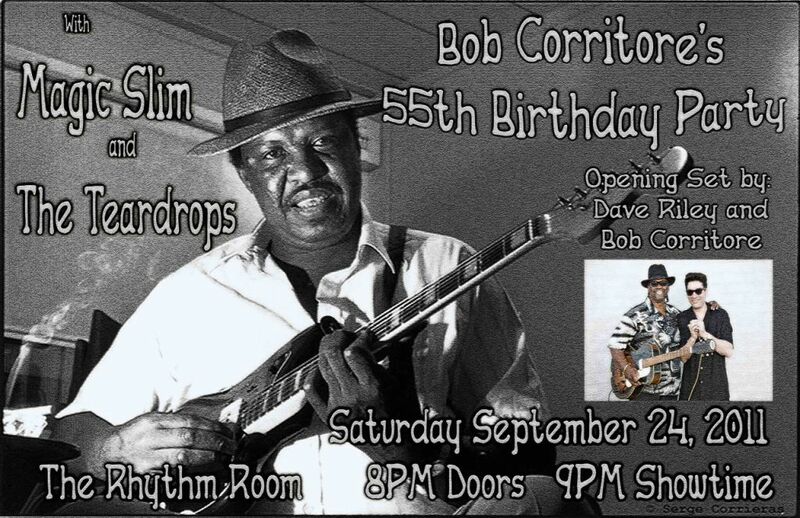 Bob Corritore was called on stage to perform with Magic Slim at Bob’s 55th birthday party on September 24th at The Rhythm Room. 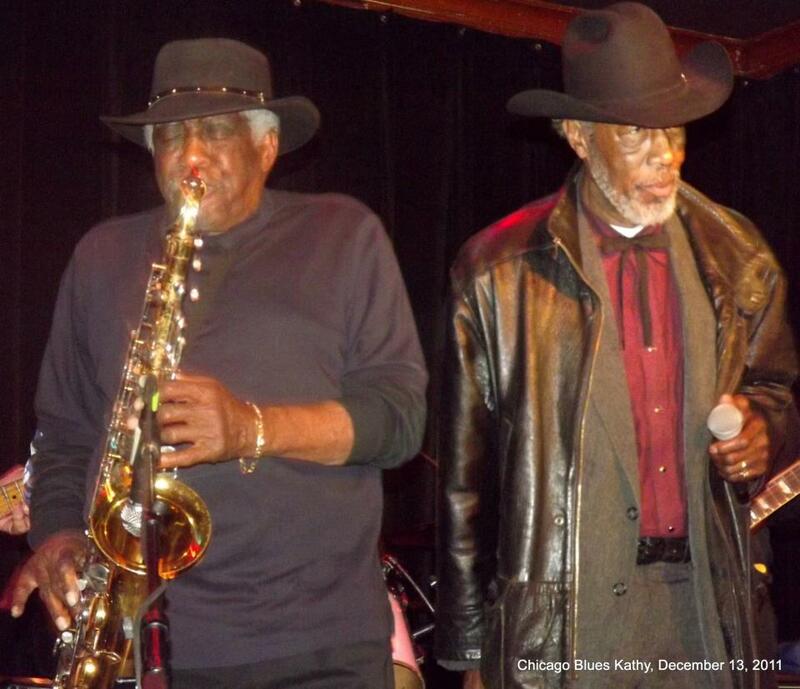 Dave Riley and Bob Corritore did the opening set that night with guests Jessi Colter and Jerry Lawson each playing a song. 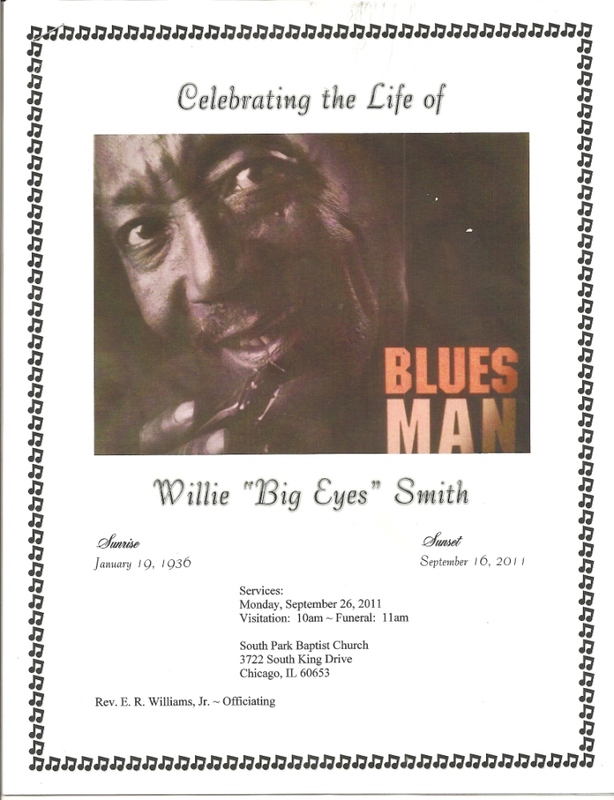 It was sad to attend Willie “Big Eyes” Smith’s funeral on September 26th in Chicago. 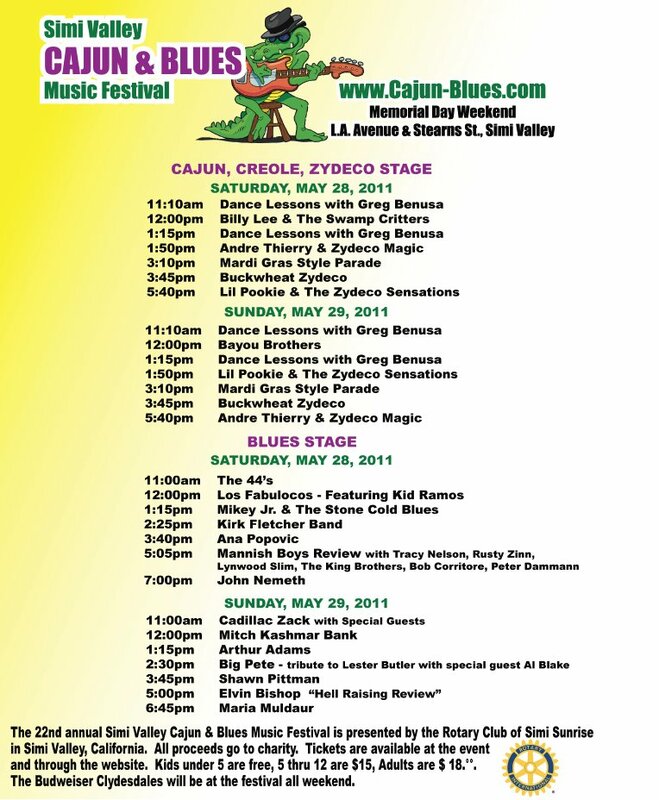 Here is the funeral program. 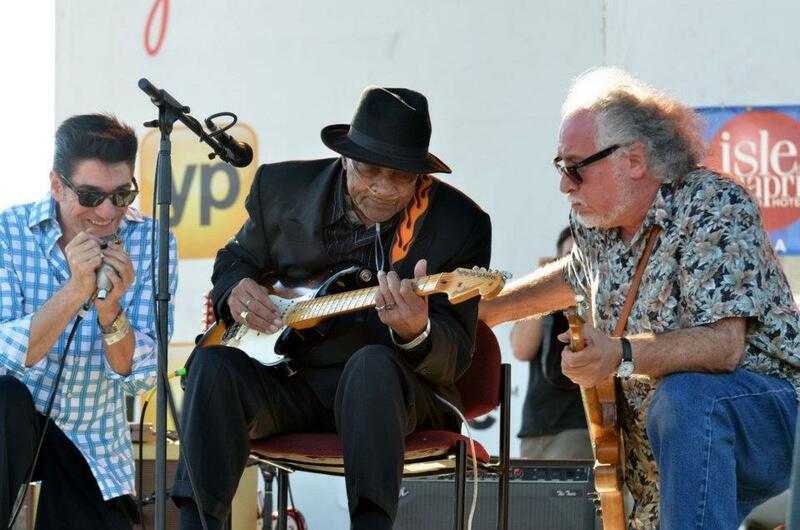 Bob Corritore, Bob Margolin, Kenny “Beedy Eyes” Smith, and Bob Stroger on Friday, October 7th, performing at the Delta Cultural Center for the first of three tributes to Willie “Big Eyes” Smith at the King Biscuit Blues Festival in 2011. 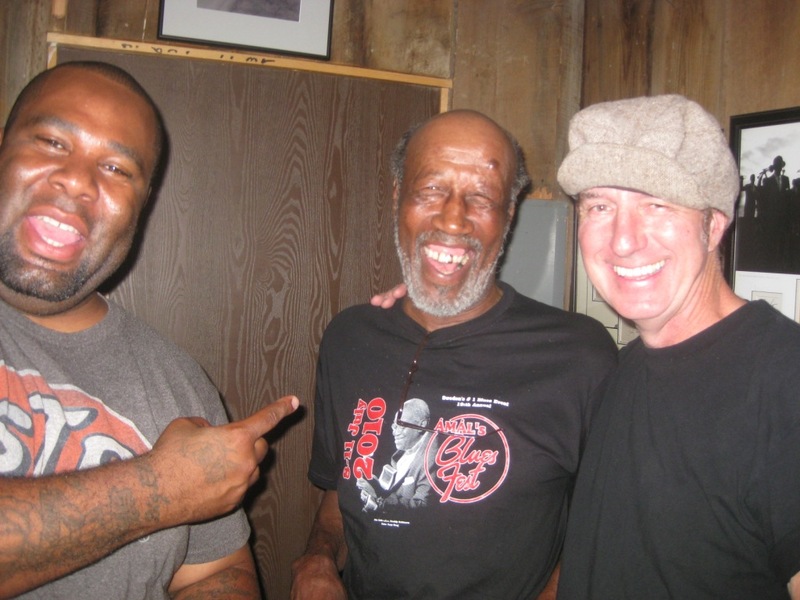 When Kenny sang that afternoon and sounded so much like his dad, it stirred something inside of all in attendance. 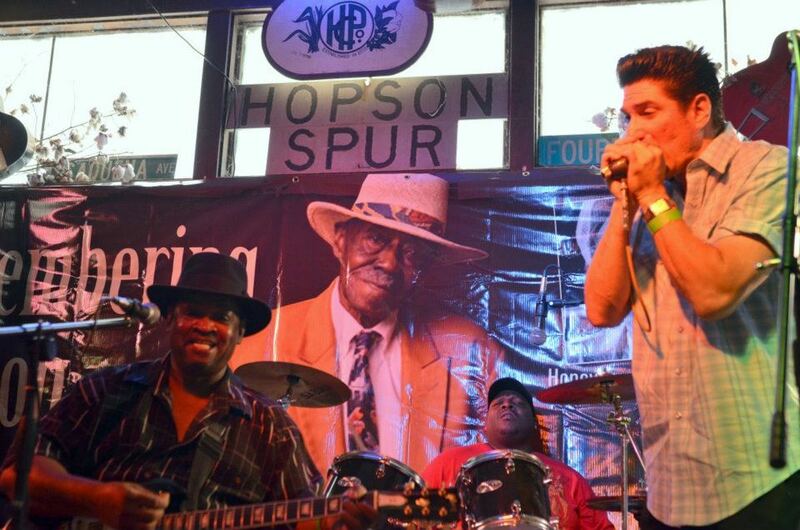 Pinetop’s image on the backdrop oversaw the proceedings. 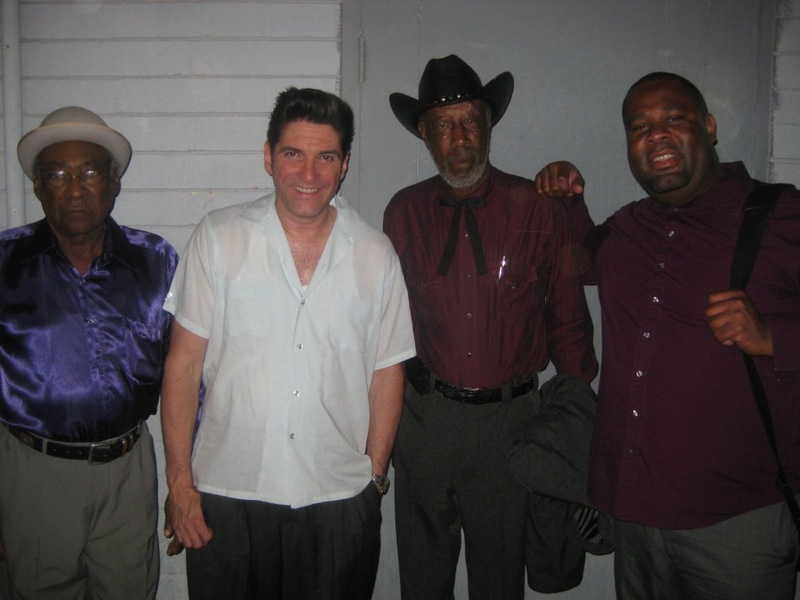 Kenny “Beedy Eyes” Smith, Bob Corritore, and Bob Stroger paying tribute to both Pinetop Perkins and Willie “Big Eyes” Smith on Sunday, October 9th, at the Pinetop Perkins Memorial Homecoming at Hopson’s Plantation in Clarksdale, MS. 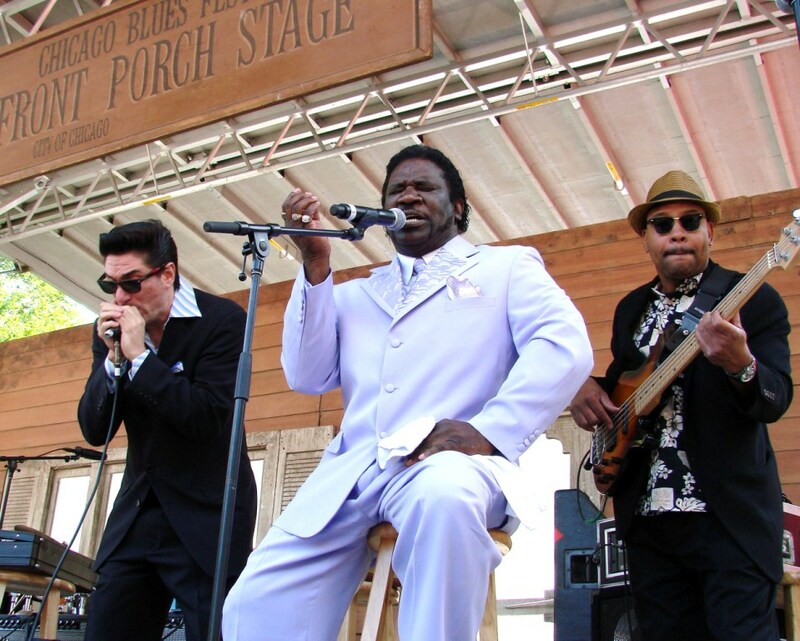 This was the tribute of the week around the King Biscuit Blues Festival. 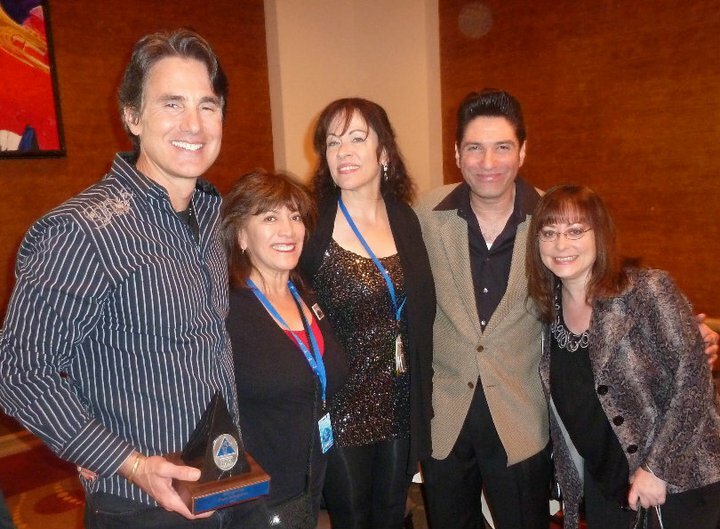 Bob was honored when Tony asked him to be a part of the tgribute to his late wife Robin Rogers at the awards show. 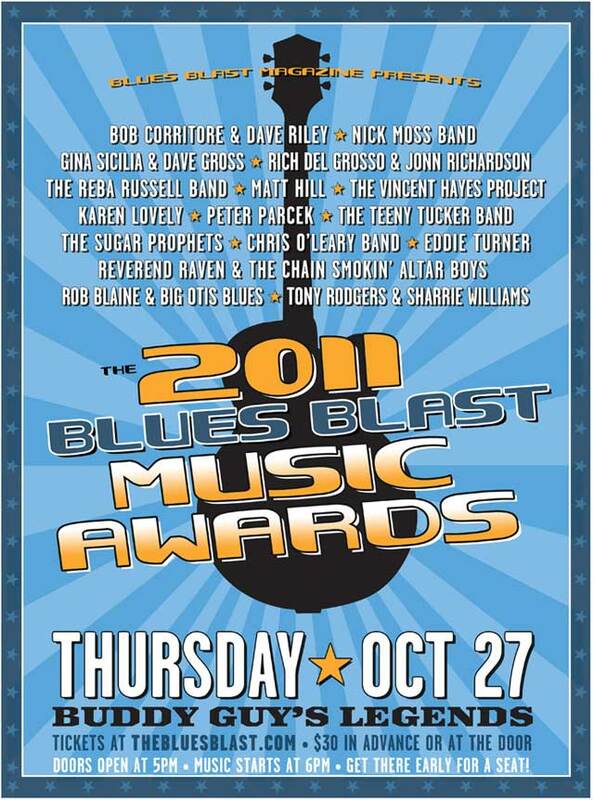 Robin won the award for “Female Blues Artist of the Year” that night! 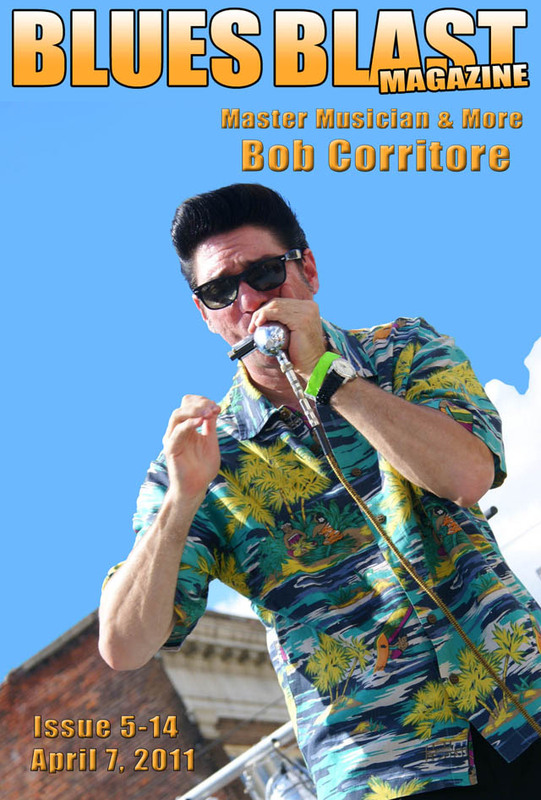 At The Rhythm Room Halloween Party on October 29th, all the staff lovingly dressed up as Bob Corritore! 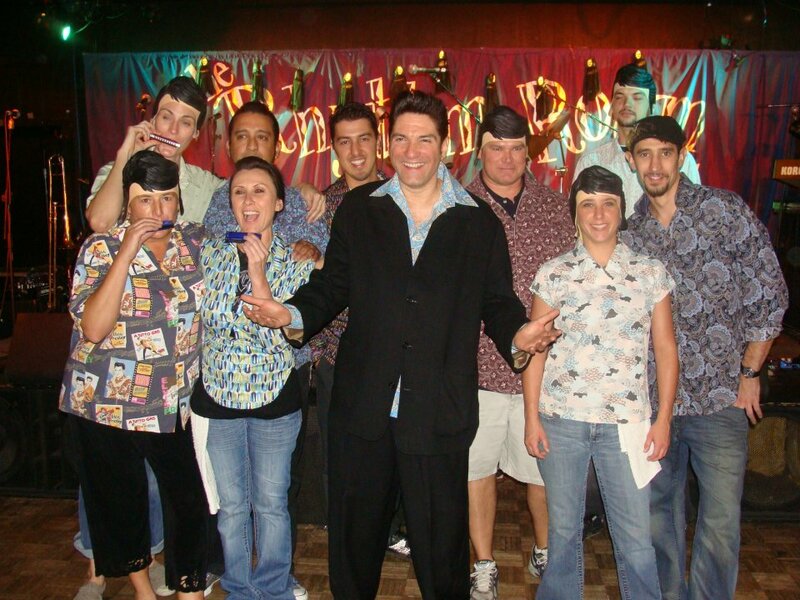 Can you guess which one is the real Bob Corritore? 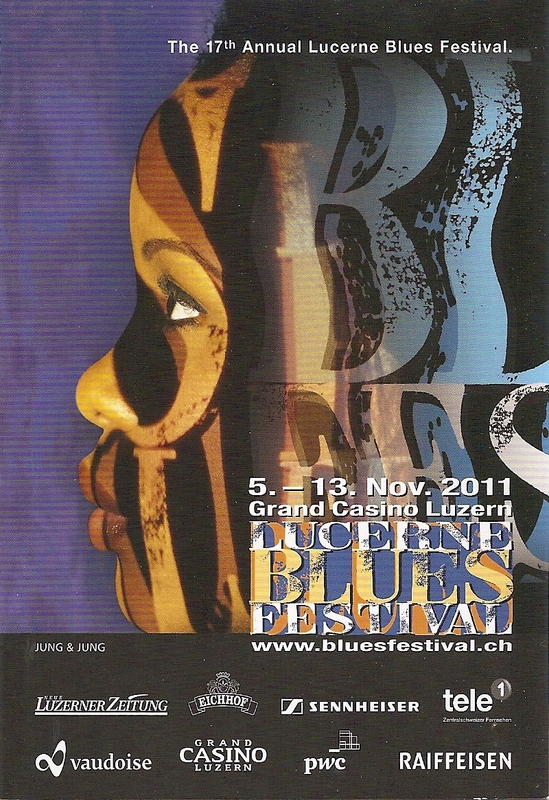 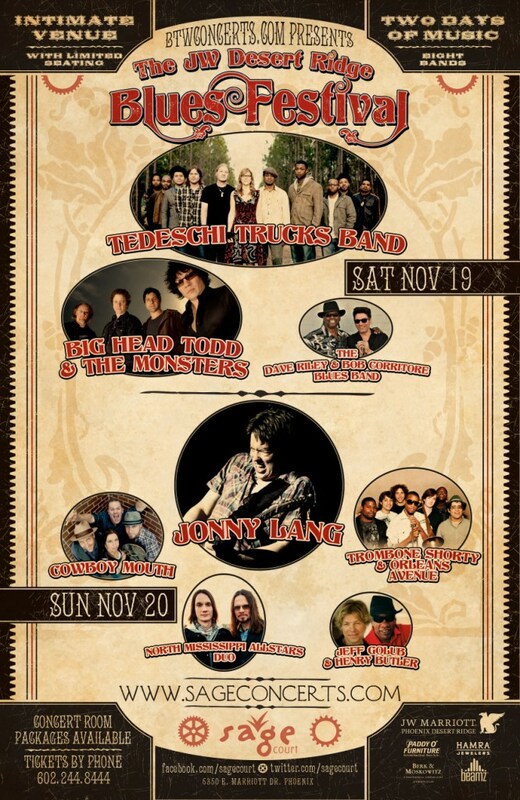 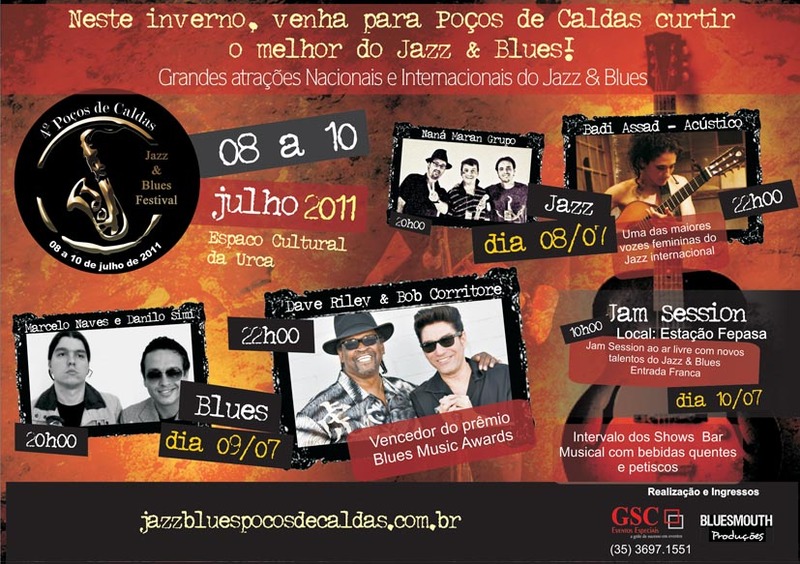 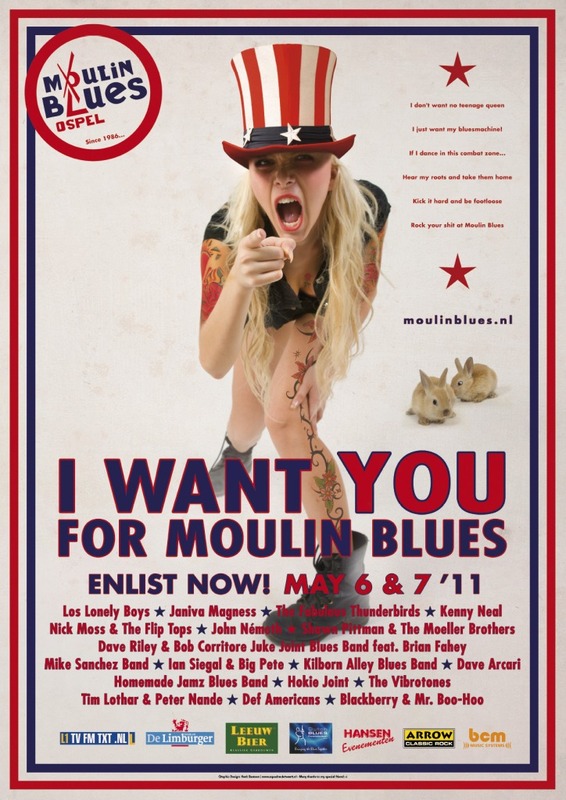 Here is the handbill art for the 2011 Lucerne Blues Festival. 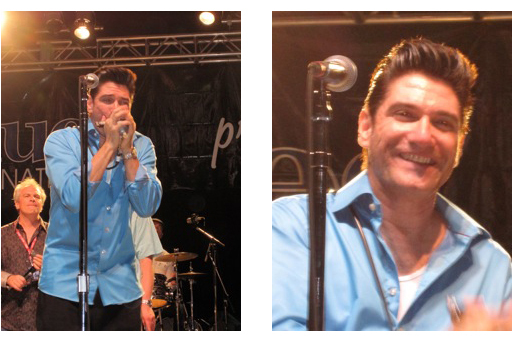 Bob spent the first two weeks of November at this festival including many pre-fest events. 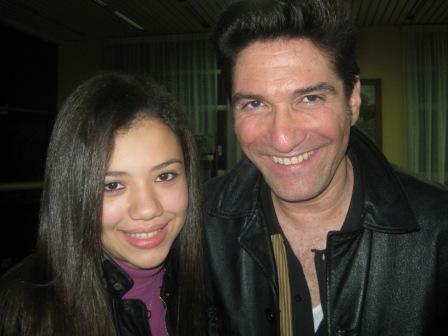 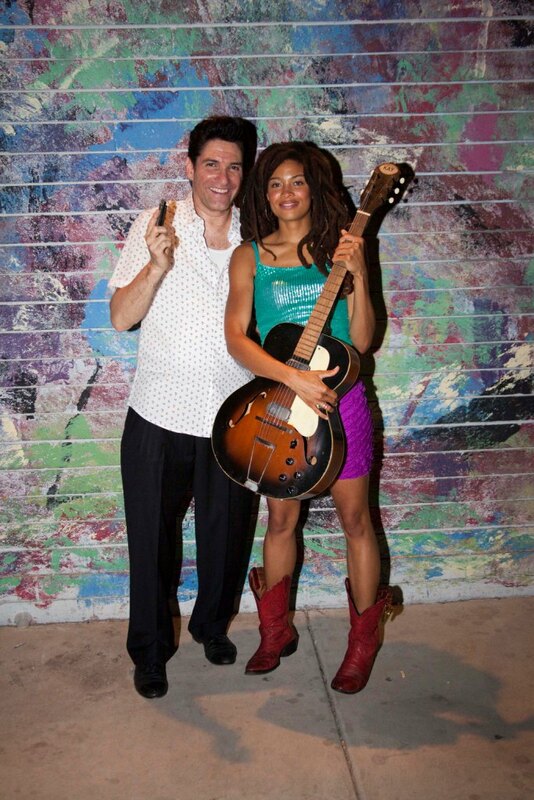 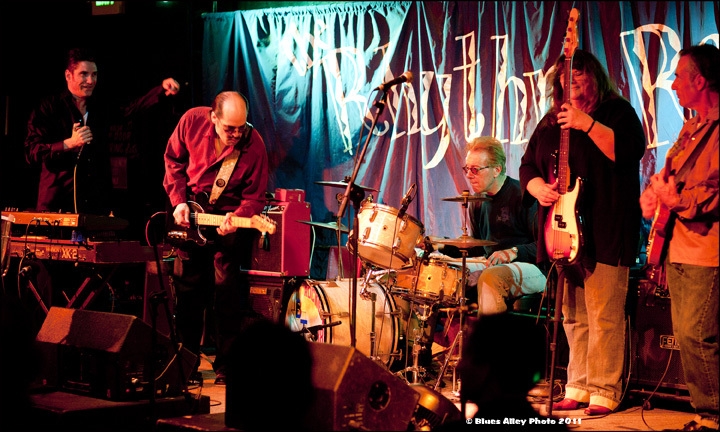 Bob Corritore made a number of guest appearances with the great Rocket 88s in 2011. 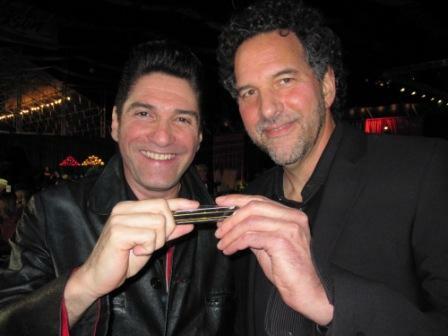 Band leader Bill Tarsha, who is a simply great harmonica player, has become a great drummer also, and these days he has made drums his primary instrument. 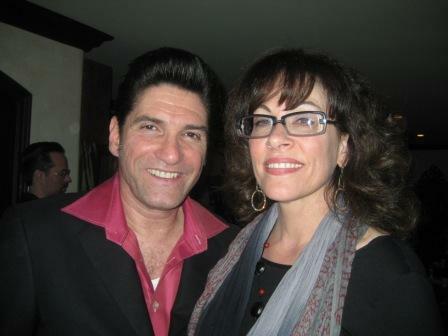 Here is a photo from November 25th. 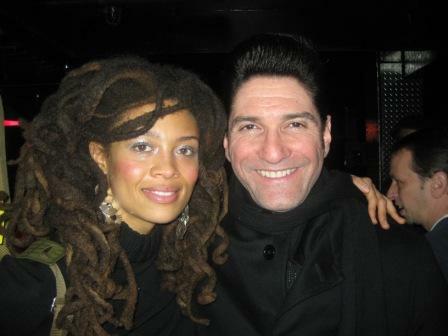 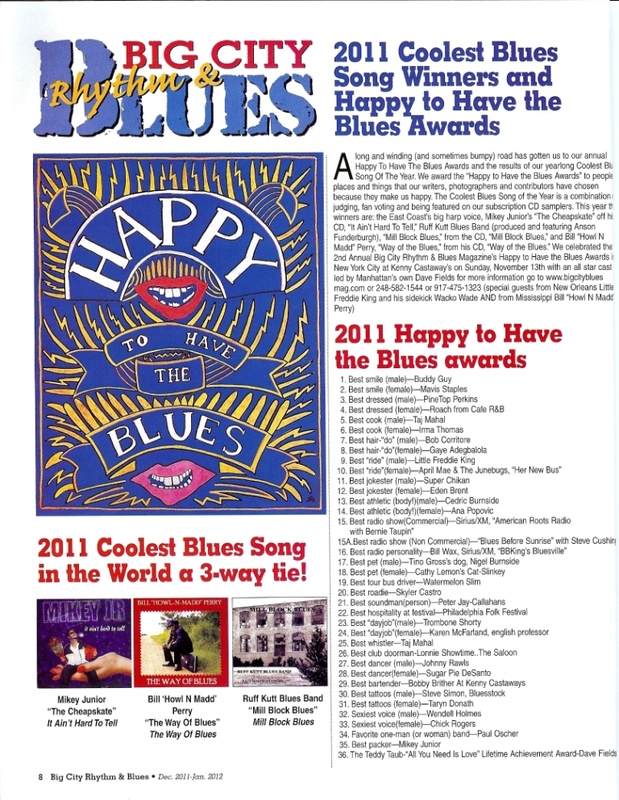 In December of 2011, Big City Blues Magazine gave Bob Corritore a “Happy To Have The Blues” Award for Best Hair-Do (male)! 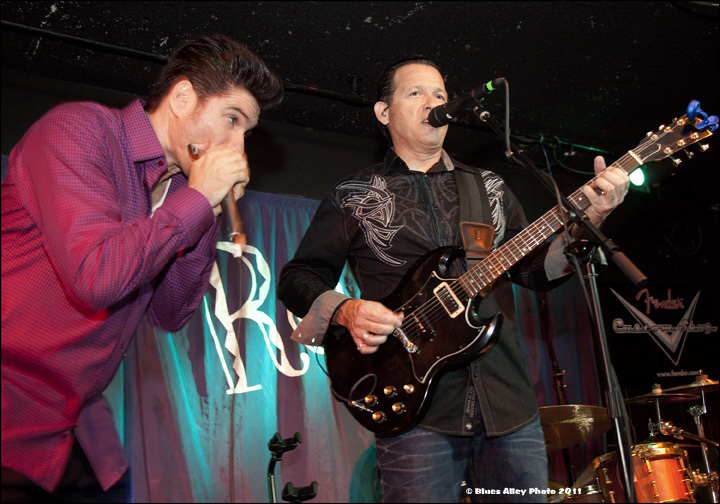 The great Rod Piazza and his band The Mighty Flyers played The Rhythm Room on December 17th. 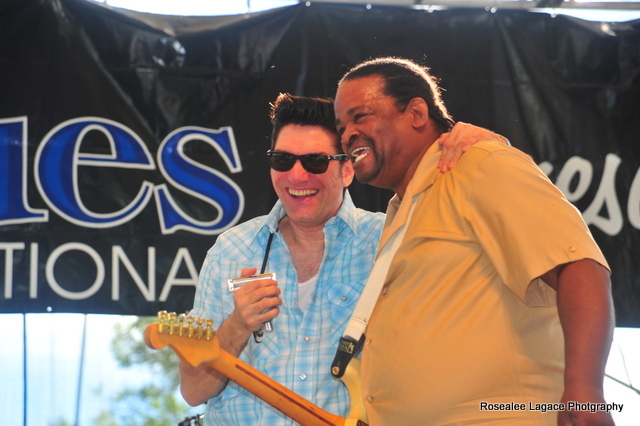 Rod called Bob onstage to join him for a few numbers in the second set!